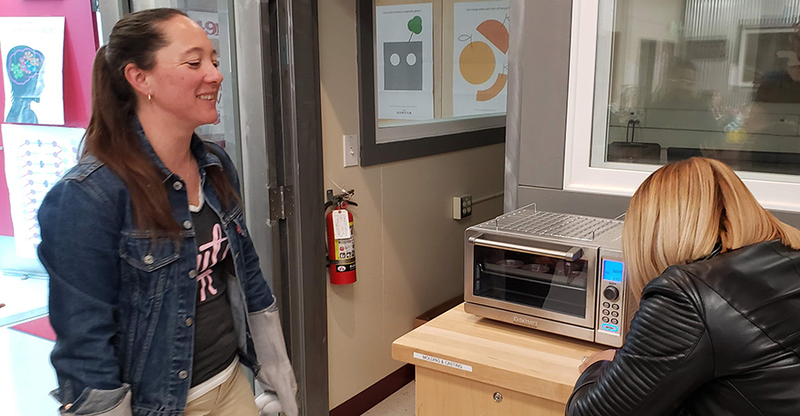 The first three months of 2019 saw a flurry of Professional Development in Fab Labs from Mississippi/Louisiana to California. Fab Labs have a full quiver of digital fabrication tools and a well-stocked electronics station. The goal for these Professional Development workshops or FFI’s (Fab Faculty Institute) was to do some cross-platform training that would introduce faculty and lab managers to equipment and techniques that are often underutilized. While we go into the Fab Labs with an agenda for each day, the most important aspect is for faculty and managers to have time to “mess about” with some guidance from the FFI leaders. 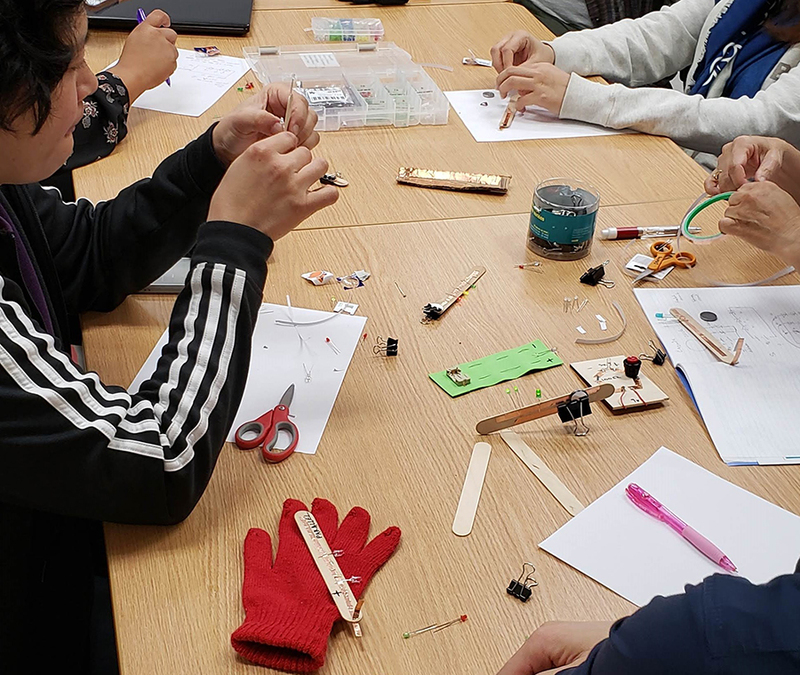 In Santa Clara, middle school and high school teachers expressed an interest in learning about Arduinos so that they could help their students in robotics competitions. Arduino is an “open-source electronic prototyping platform enabling users to create interactive electronic objects.” Instead of using actual physical components such as capacitors and resisters to control inputs and outputs, one can write code and load it onto the Arduino. 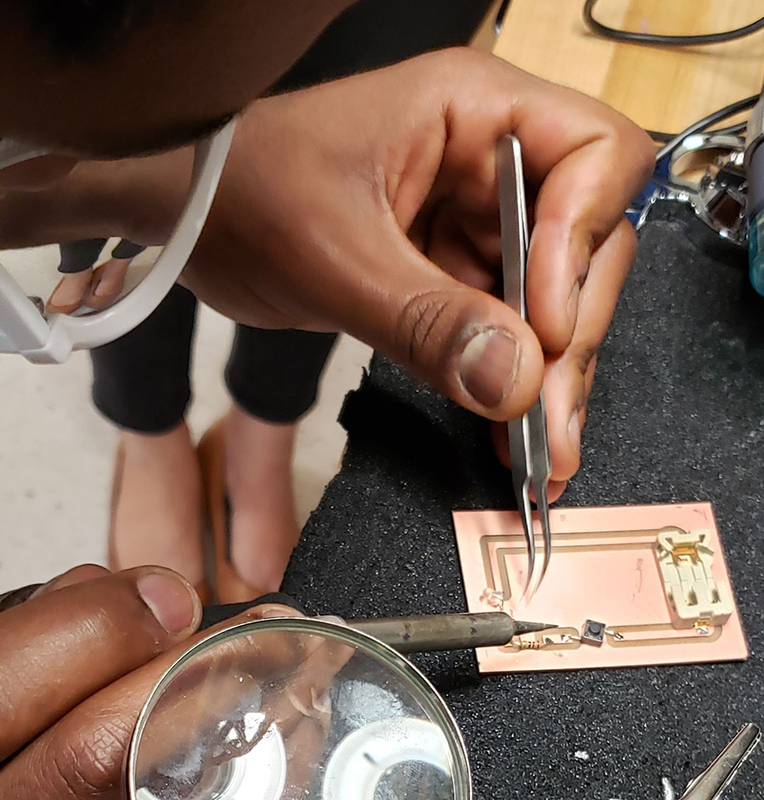 Rather than leap to Arduino without understanding the basics of circuits and electricity, we started with some simple circuits using conductive thread or copper tape, LEDs, batteries and switches. 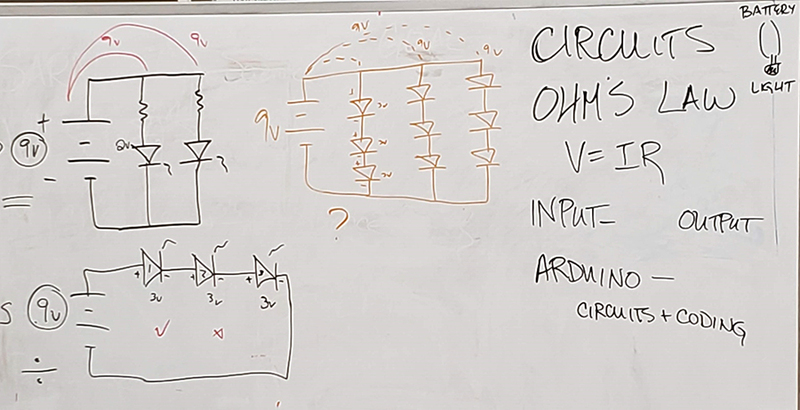 Basic circuits on the board. Teachers using popsicle sticks, copper tape, LED’s, batteries and clips to prototype circuits. 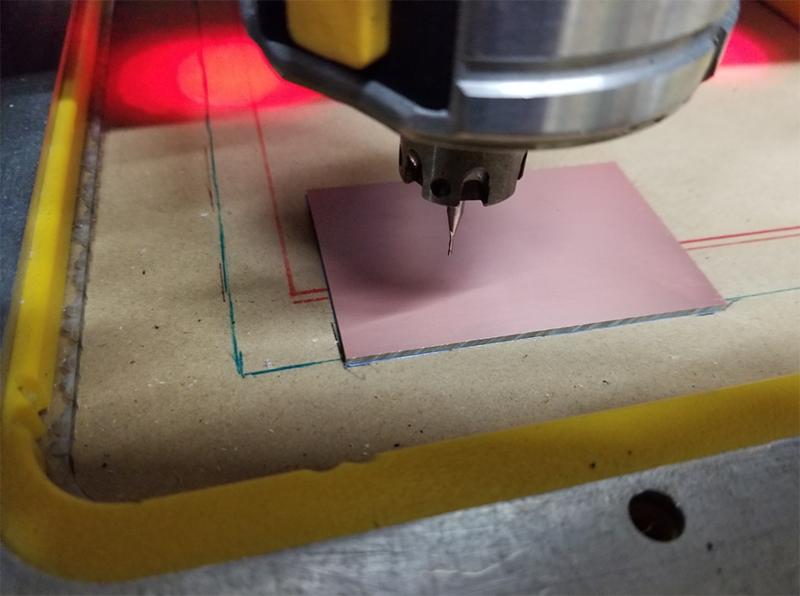 With help from FFI leaders, one teacher used VCarve Pro to create a drawing for a circuit, machined a copper blank using a 1/16” bit on the ShopBot CNC, and soldered the surface mount components to the PCB to make a flashlight. One project, several skills. 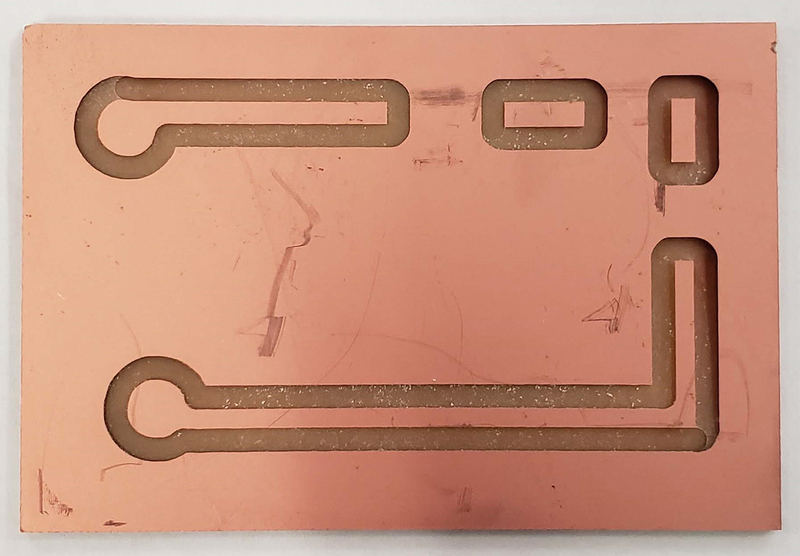 PCB blank with a thin layer of copper on the board, machined on the ShopBot PRTalpha with a 1/16” bit. In Jackson County, Mississippi, managers from three Fab Labs joined together: Jackson County (Vancleave, MS), NOLA (New Orleans, LA), and the newest, Jackson (Jackson, MS). 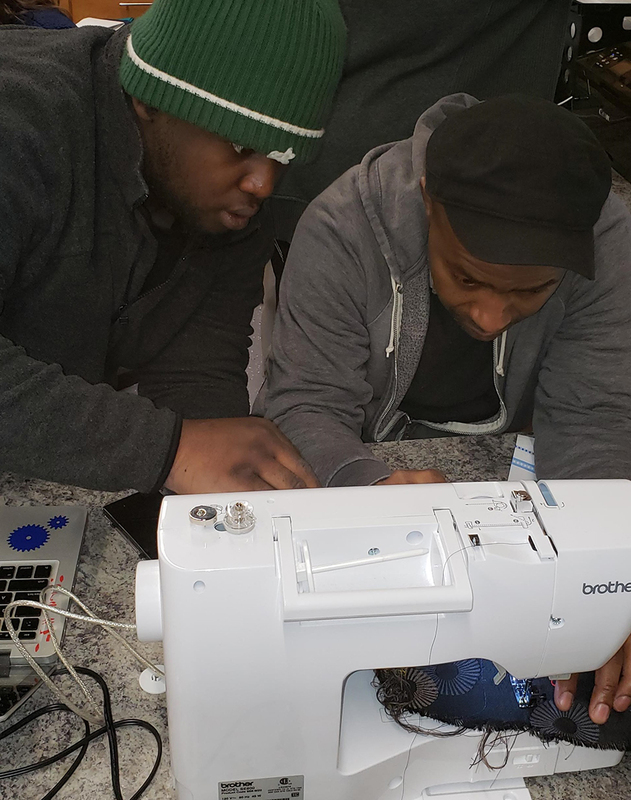 They were interested in learning about the sewing/embroidery machines that often sit idle because A) sewing is a skill that is seldom taught in schools or at home B) the digitizing software is unfamiliar to them c) they had never taken the time to actually use the machines. Again, we started with the basics: hand sewing. In a room of adults, several had never threaded a needle or tied a knot in thread. 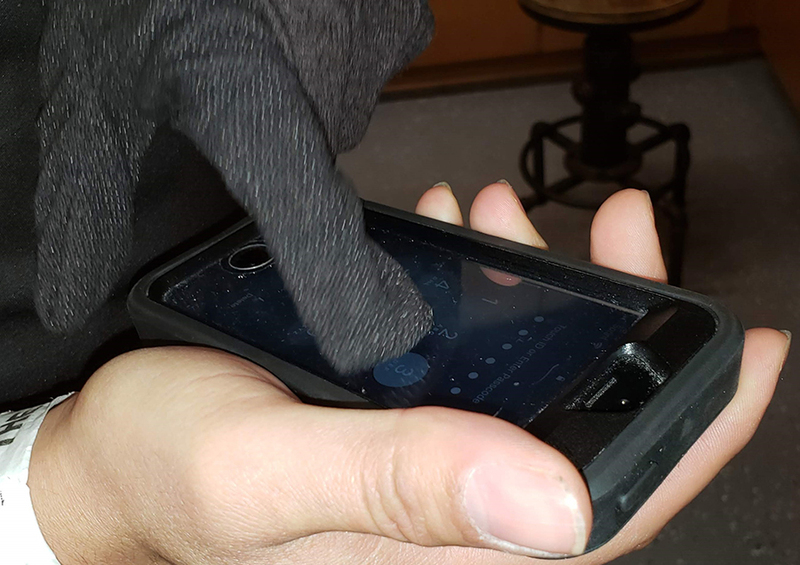 To make the project a bit more interesting, we used conductive thread to make ordinary gloves into “smart” gloves that could be used with smart phones. Hand sewing conductive thread onto the fingertips of gloves. 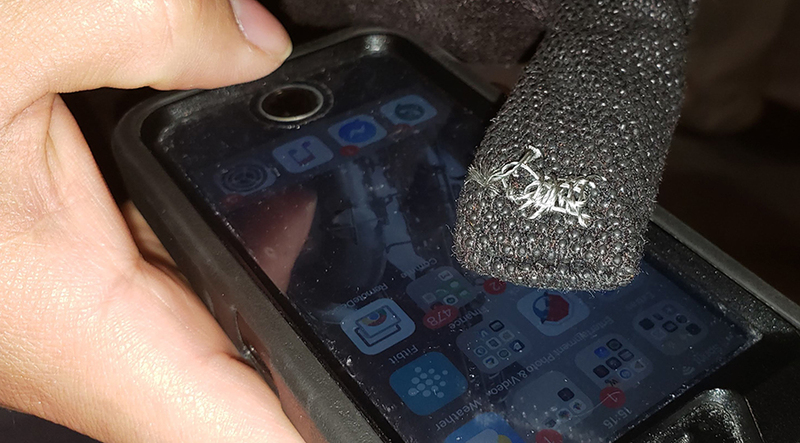 With a simple pad of conductive thread, an ordinary glove now works with a smart phone screen. From there, we threaded the sewing machine and used utility stitches to make a little bag, and the embroidery stitches to personalize it. What does this have to do with ShopBot? The digitizing softwares for embroidery machines are CAD programs. Many of the terms and tools used in one software are the same as the CAD software used for the ShopBot CNC or a laser cutter. Who knows which machine will spark enough of an interest in a teacher or a student to get them over their fear of using a computer-controlled or digital fabrication tool? Success on one digital fabrication tool can open up worlds. 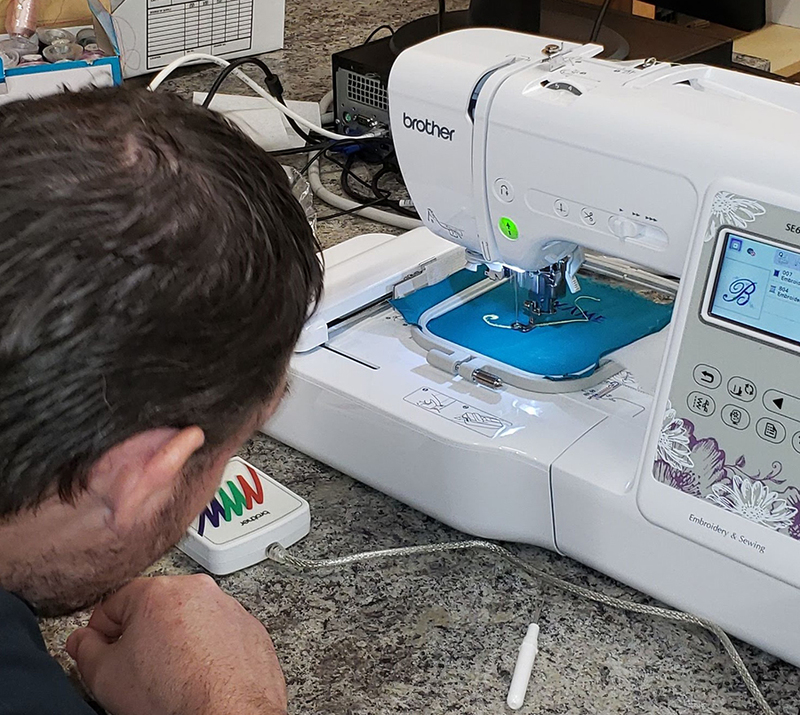 Using utility stitches with a sewing machine. Watching the embroidery machine do its thing. This math teacher from Santa Clara didn’t know she could have an interest in an embroidery machine. 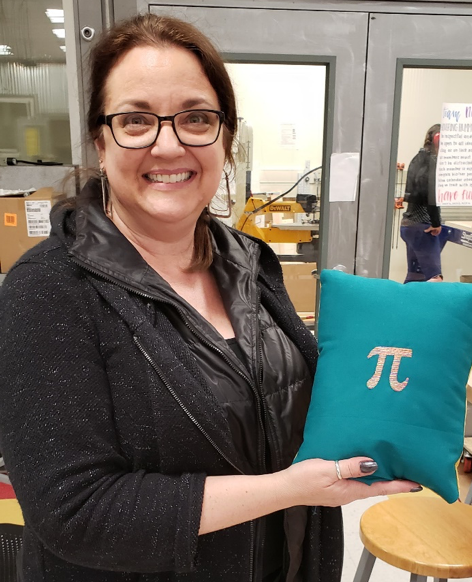 Check out that smile after digitizing Pi, embroidering it onto fabric, and sewing up a pillow! 3D printing was intended for rapid prototyping of designs, and was not intended for production of multiple copies of the same thing, like rubber duckies or Yoda heads. But its rise in popularity has contributed to the development of many CAD software applications, and even 3D scanners, that can create 3D models on the computer. 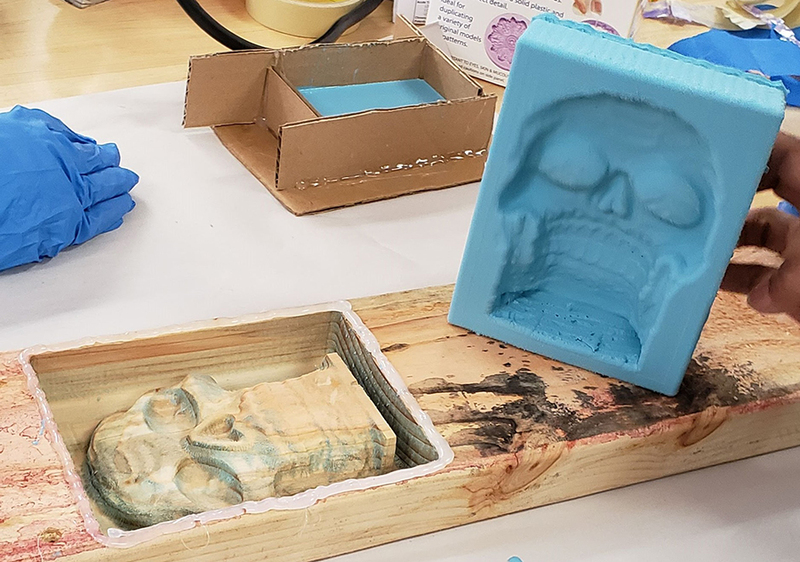 Many of the same files that can be used with a 3D printer can be 3D carved on a ShopBot, and the resulting model used to create molds to aid in the production of many copies. At Santa Clara, we imported an .stl file into VCarve Pro for machining on their ShopBot PRTalpha. 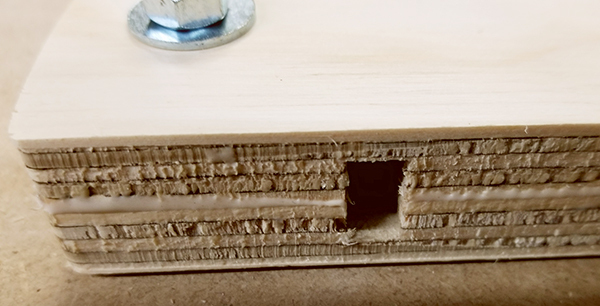 After sizing onto a 2”x 6” from the local building supply store, we created a roughing pass to clear out the majority of the material. We then used a ¼” ball nose bit to finish the 3D carving. Time from start to finish for the roughing and finish passes: 27 minutes. Once we had the model, we added a bit of hot glue around the edge to give the mold a little more depth, then filled the model with a two-part flexible mold making material from Smooth-On. After it cured, we pulled the mold from the model. For this experiment, we filled the mold with melted paraffin and crayons. Think soap, plaster, or, with food-grade mold material, chocolate! Model 3D carved on the ShopBot (27 minutes), and mold made from a two-part material from Smooth-On. 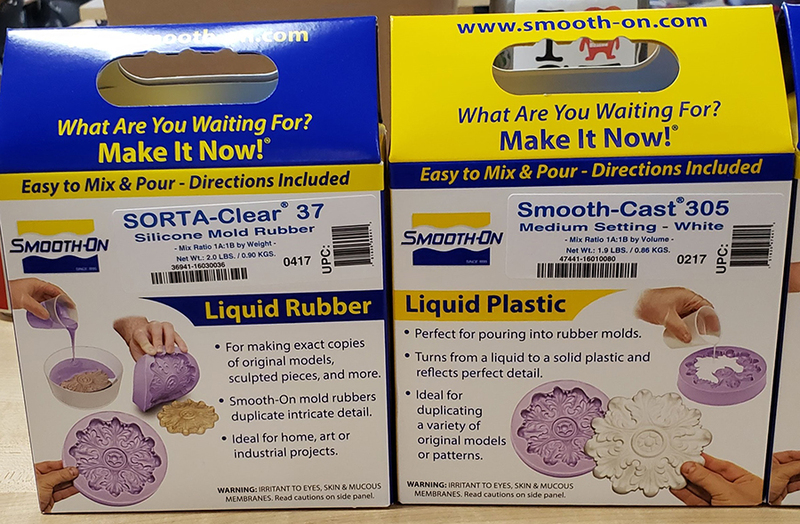 Some of the molding and casting materials available from Smooth-On. Carefully watching the paraffin and crayons melt in a toaster oven. 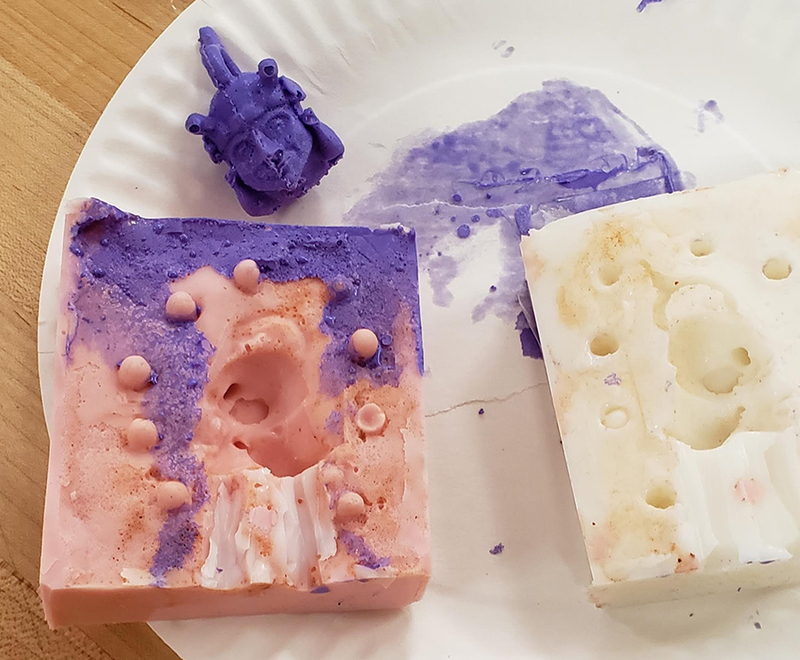 Paraffin and crayons cast in the mold. Another object cast in a 2 part mold made from a 3D printed model. 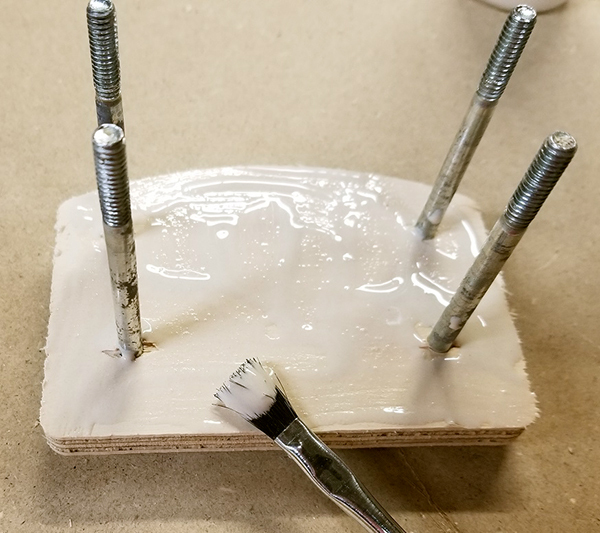 Notice the “nobbies” added to align the two sides of the mold, and sprues added to allow the material to be poured into the mold, and air to escape while the material is poured in. CAUTION – Before continuing with any of the recommended information below, the following maintenance information should be checked and double checked first, and our Technical Support team contacted before any adjustments are made to the gantry gussets or beam. 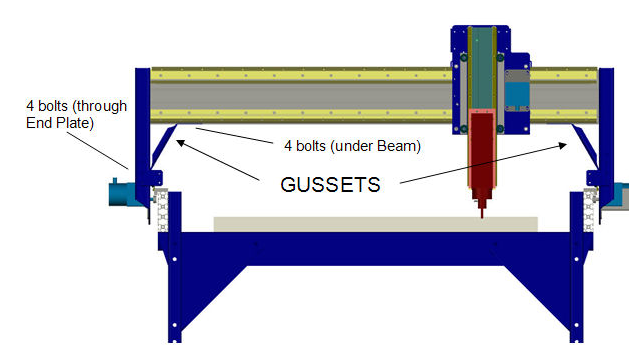 The gantry is assembled in house using specialized jigs that align the beam and end plates, if the gussets are loosened, this alignment may be lost and cause further issues that are extremely difficult to rectify without the proper equipment. First – Manually square the tool using the mechanical stops – The guide on how to do this can be found in the ShopBot 3 software under the **[H]elp->[S]quaring the X Car” drop-down. Do not adjust the gussets on the last page of this guide. Below is the original post published Dec 2, 2008. There are many reasons that your gantry can be out of square or plumb. 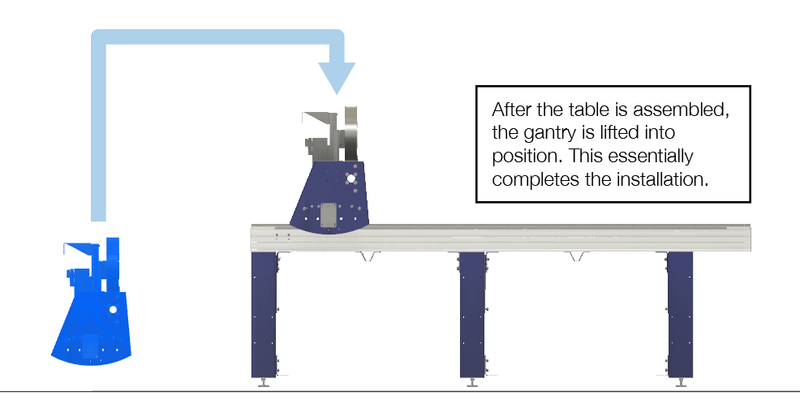 The gantry can be jostled during shipping, bolts can loosen due to vibration, moving parts wear, metal can fatigue, or the machine may have had an impact. No matter what the reason, you should add checking for square and plumb to your monthly maintenance routine. After a month of our normal use, it is not unlikely that we could be off by .100” across the table. If you have a new machine you should run it for a week or two and then check for both square and plumb. 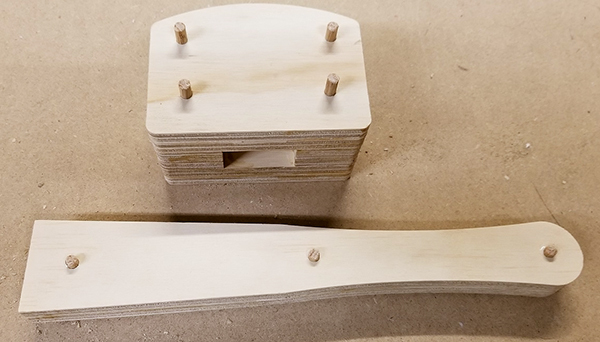 To check the spindle for plumb, place a framing square with the short leg on the table in the X direction and the long leg vertically alongside the spindle and against spindle mounting plate. Any gap between the square and the plate means that you will have to tip the Y extrusion in the direction needed to get plumb (perpendicular to the table). If adjustment is necessary, it will be done later. 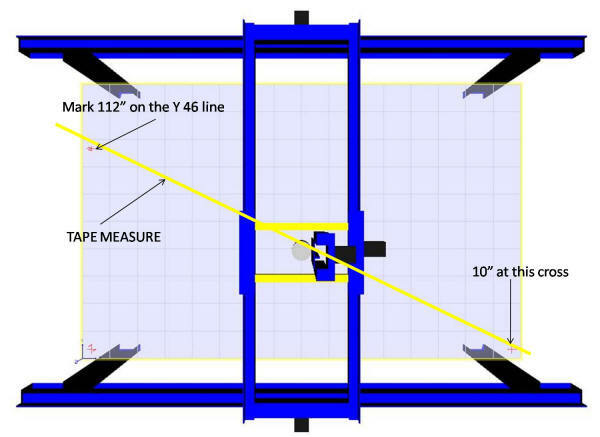 The ShopBot manuals on squaring the X car show how to use the mechanical stops to square the gantry and hold it when powered. I prefer to have my X car square when unpowered also. This allows me to depress the reset button and have the gantry square itself. Since my mechanical stops are also set square, I can double check the car quickly when needed. One of the reasons I went down this route is that my control box cannot be reached while holding the car against the stops. Another is that my gantry is square every time I power up the machine. 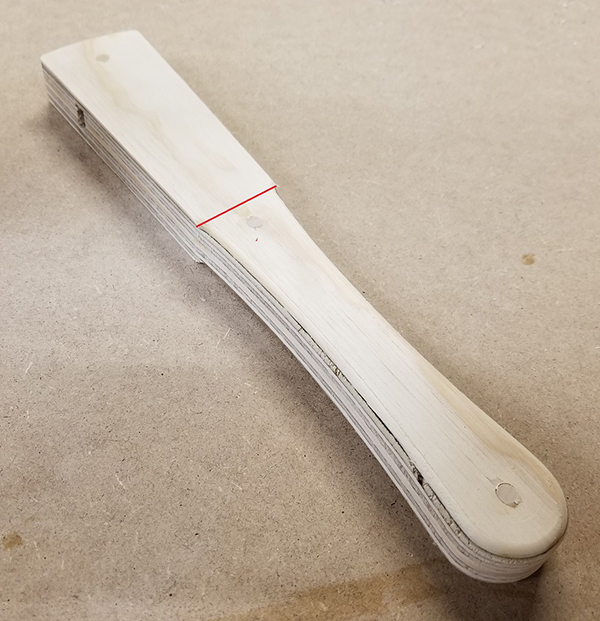 My method will add a few steps to the ShopBot methods. I wrote a short file (download the zipped file here) that cuts 3 shallow V groove crosses near the table extremities to allow us to quickly check how square our machine is cutting. To use the file you should have a fairly clean table to allow the shallow lines to be visible, a sharp V-Bit installed and have the bit zeroed to the table top. Taking time to be very accurate will pay big dividends. When you place your tape across the marks make sure it is flat and straight. 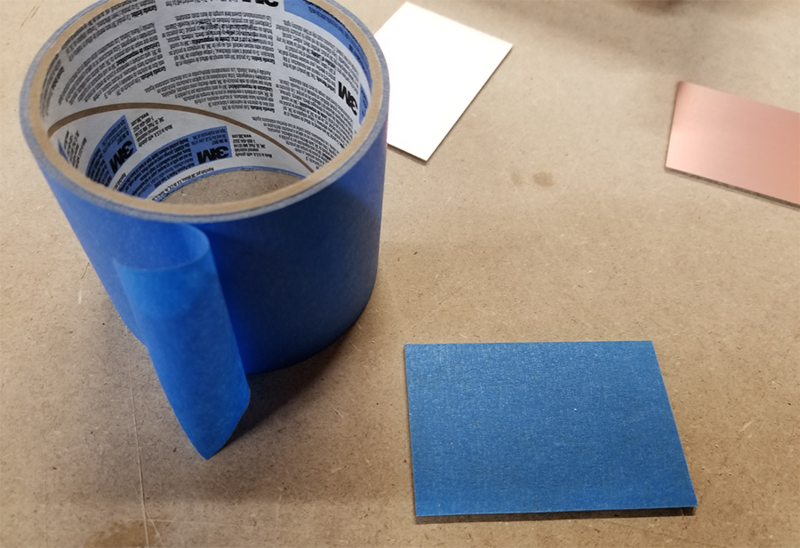 You will want to use the same edge of the tape to hold both the 10” cut and make the 112” mark. If 112” is the exact measurement to the cross, your machine is square. The file will now give a message box that asks you to make your mark. When you hit ENTER the file will ask for the difference. Using a digital caliper measure the distance between the cross (RED) and your pencil mark (either (1) or (2). If your mark is to the left as in (1) then your difference MUST be a negative number. The file will then display a message box and ask you for the distance from the bit to the Y = 0 (front) wheels. Measure this and enter the number (+/- .25”) Hit ENTER. CAUTION: The machine will move slightly! This will adjust the amount needed to properly square the gantry. The file will now display a message box and tell you to clamp the X car. 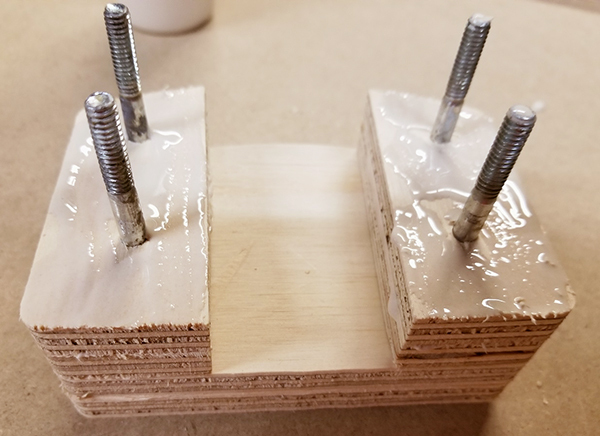 I do this by clamping a 2” by 6” by ¾” wood block with a ¼” deep v groove in it on either side of the wheels to the X extrusion with rubber covered bar clamps. I then use another clamp that holds the gusset down securely to the extrusion. When this is done, hit ENTER. A message box will display and ask if you are ready to move. Hit ENTER. CAUTION: The tool will now move to the Y = 46 line and drop the bit to .125 off the table. 2 message boxes will display with instructions to loosen bolts and shut down control box. Hit ENTER at both, put SB3 software in preview mode and power down the control box. If the difference was greater than .100” then you will have to loosen both the under beam bolts AND the bolts thru the end plate. 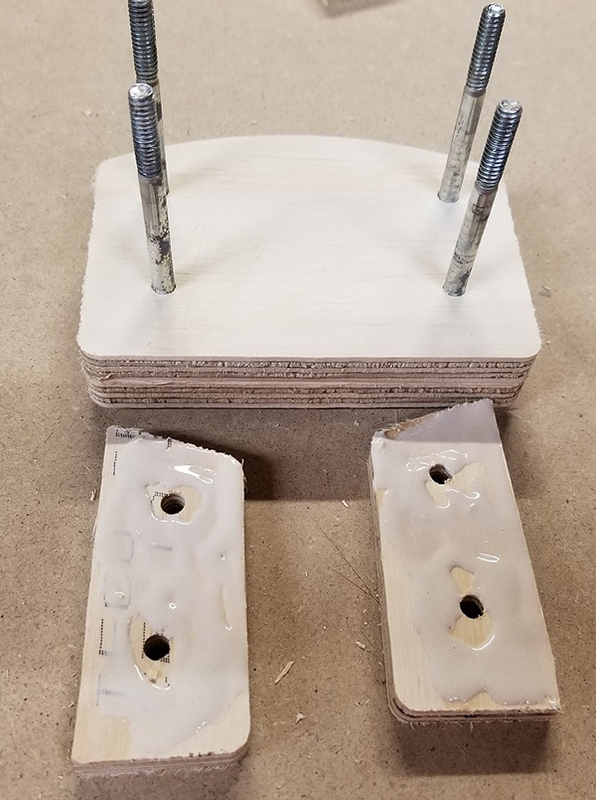 If you determined earlier that you want to plumb the spindle, then you must loosen the under beam bolts, end plate bolts AND the 16 hex socket head bolts that hold the end plates to the extrusion. Whichever combination you select, you should loosen the bolts and leave them finger tight. This allows adjustments to be made, but keeps the parts close to alignment. 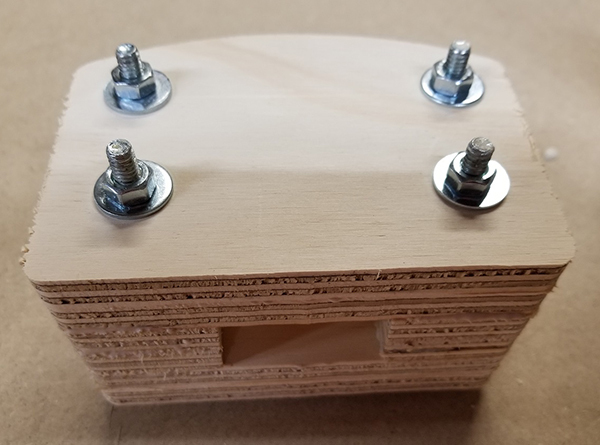 As you make your adjustments, you may have to snug, loosen and resnug these bolts to keep parts properly aligned and get everything square, plumb and of course, level. BEFORE LOOSENING BOLTS, PLACE A PENCIL MARK UNDER THE BIT AND WRITE DOWN THE X COORDINATE SHOWN ON THE CONTROL PANEL. If you are not plumbing the spindle, skip this step. Place a clamp on the +Y end plate to insure the wheels are seated on the rail. Loosen the 8 +Y hex socket bolts ¼ turn additional. Check to see if the extrusion will tilt in the direction needed. If not, loosen all but the lower left of the –Y hex socket bolts. Move the extrusion as needed to align with framing square. Lightly snug the 8 –Y hex socket bolts. Making sure that the +Y wheels are properly seated in the rails; lightly snug those 8 bolts also. 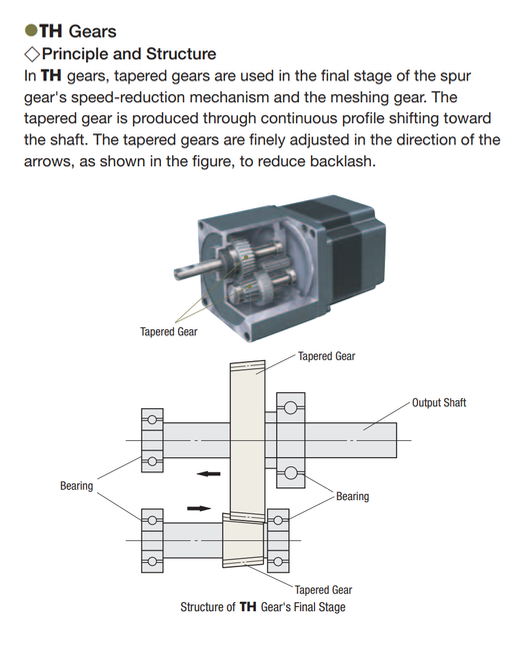 Recheck spindle. Repeat as needed. When spindle is plumb, carefully tighten all 16 hex socket bolts securing the side plates to the Y extrusion. Remove the clamp from the +Y side plate. IF you did not have to plumb the spindle your goal is to move the +Y end of the gantry so that the bit is over the cross. If you did tilt the extrusion, then you will need to move the +Y end of the gantry the decimal difference between the displayed X coordinate and 2”. If display is 2.15 then difference equals negative 0.15” If display is 1.85 then difference is plus 0.15. The difference is the amount to move the bit in the direction indicated. (Plus = positive X direction.) Using the caliper set to the proper number, make a new pencil mark from the mark that is under the bit. That mark is the target mark to move the bit to. I like to move the end of the gantry past the mark and let it relax back to it. 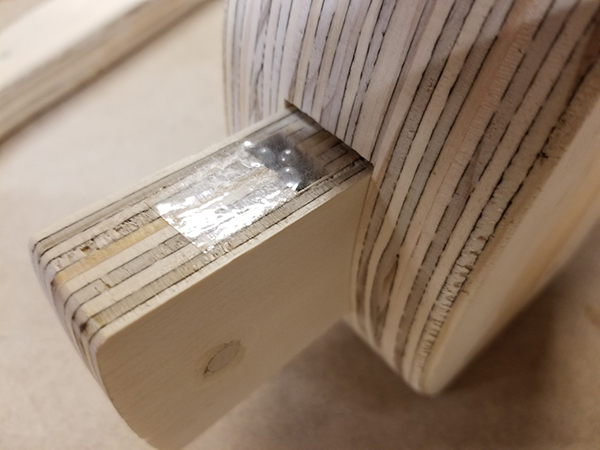 Using a block as above with a v groove in it to push the end plate to the target mark (or just past), clamp block down to X extrusion with padded clamp. Use another clamp to seat wheels on rail. In 2 stages tighten all bolts starting at the –Y side and ending with the +Y side. Release clamps and check that bit is over target mark and wheels are seated properly. If not, loosen bolts and repeat. 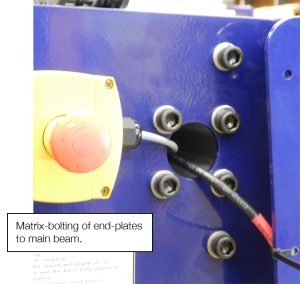 You may have to push end plate farther beyond mark to insure that gantry “settles in” just above the target mark as you retighten bolts. Double check all bolts to insure that they are tight. YOU ARE DONE! You may want to run the file in 2D offset (-1” X, -1”Y) to check your results. When you are satisfied that you are square, this would be a good time to adjust the stop blocks to the square gantry. We run this check anytime we notice cuts not perfectly square, and usually around once a month. Hopefully, you will find it as valuable as we do. At ShopBot, we’re understandably passionate about making things with CNC machines and about the power of digital fabrication tools. 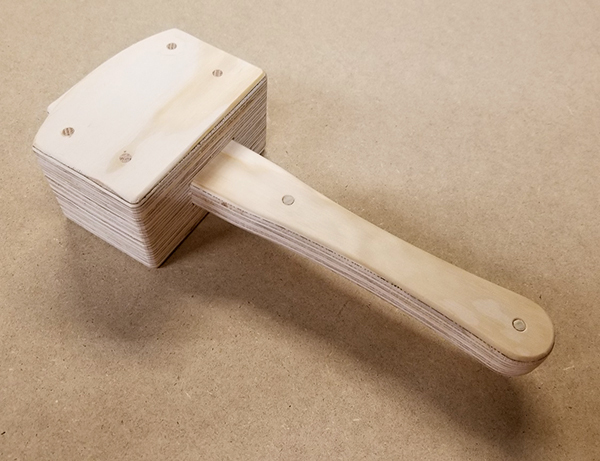 We’re always looking for ways to help show what these amazing tools can do, and for items that are made with a ShopBot that showcase several of the processes that a ShopBot tool can handle. 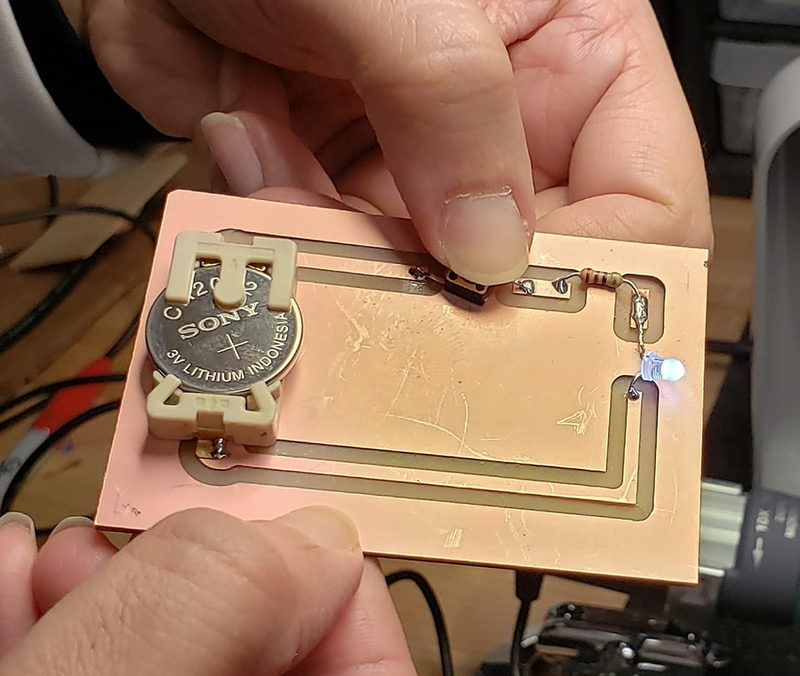 Things that use multiple materials and techniques to give a broad overview of the power of CNC in a small, tangible package. Every once in a while, Jeanne (Director of Marketing and Sales) at ShopBot prods me for something new, but it had been a while since an idea resonated with me. Then late last year, I saw some led lights on the Amazon “deal-of-the-day” that were inexpensive and looked kind of interesting to me. They were cheap enough that on an impulse I ordered a few strings without really having a project in mind for them. 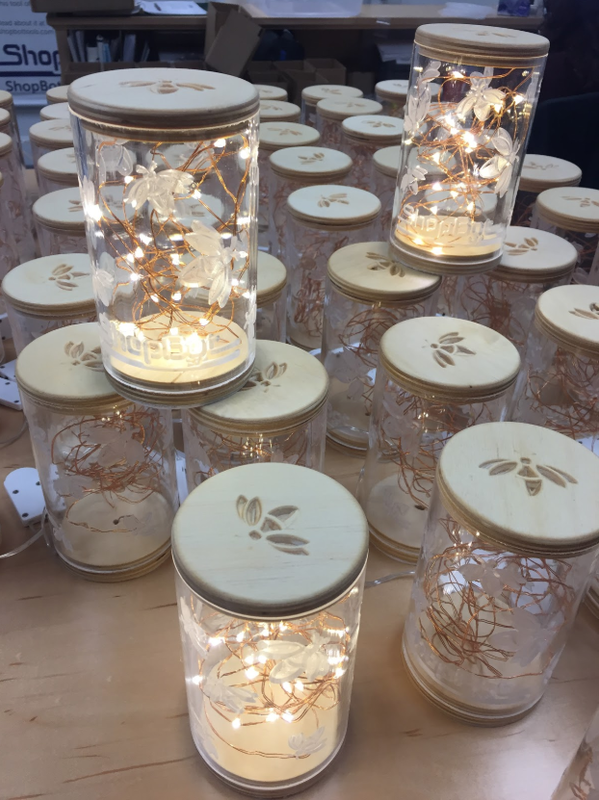 I kept thinking that they looked like fireflies, and decided that I would make an updated (and more humane) version of the jars full of fireflies we used to have in our bedrooms during the summer when we were kids. Digging through the scrap pile in my shop, I found some 3” clear acrylic tube, cut caps out of plywood scrap to fit in the ends, drilled a couple of holes, and stuffed the string of lights inside the tube. When I turned it on it looked pretty neat so off it went to my buddy Robert’s daughter Rowan to help her feel like summer wasn’t too far away! I had enough tube and strings of lights to make a couple more, so on my next trip to ShopBot HQ I took my samples along to show Jeanne. They were kind of plain looking being just a tube full of lights, but I felt that with a little bit of CNC wizardry that they could be made pretty cool looking. I described my vision to her for carving designs in the tubes, and she not only liked it, she wanted 200 of them to give out to people! This meant that I had to go from playing around with one-offs to full production! 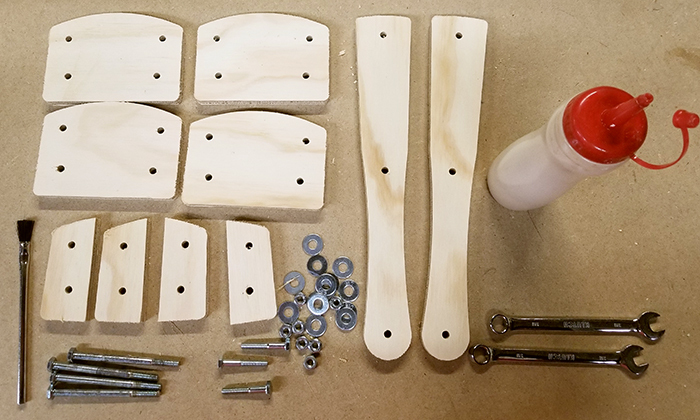 I’ve got a pretty good assortment of ShopBot tools in my shop, and figured that I could use my Desktop MAX to cut sheets of plywood discs for the end caps and a Handibot® to carve decorations into the lids and drill and groove for the wires in the bases. 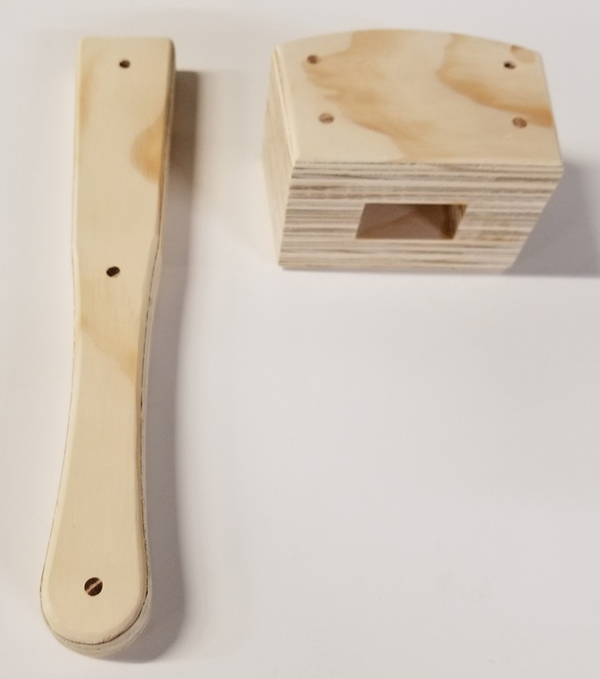 To engrave the designs on the tubes, I needed an indexer—a fancy version of a lathe that is precisely controlled and synced with the motion of the rest of the tool. 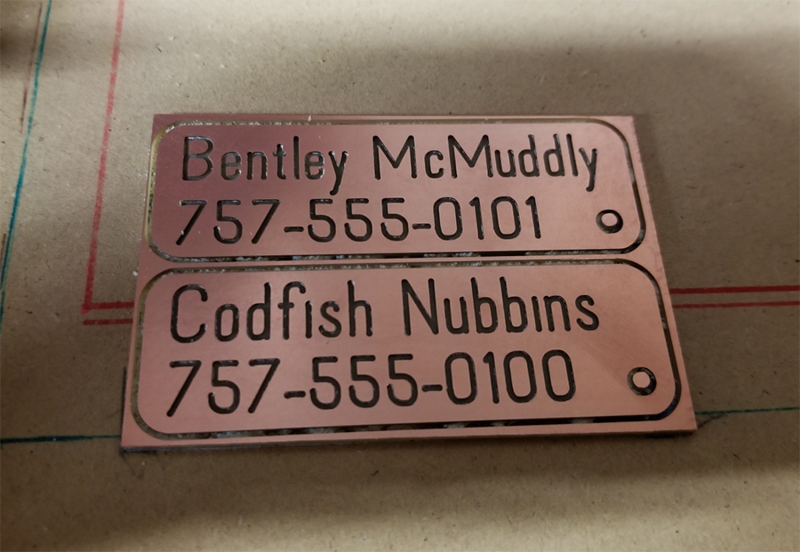 I told Jeanne that I needed an indexer if she wanted me to do the engraving that would make it interesting, and went home with a second Handibot mounted over an indexer. These three machines, along with some standard shop tools like table saw and sanders, would each do their part to turn my shop into a mini-factory. 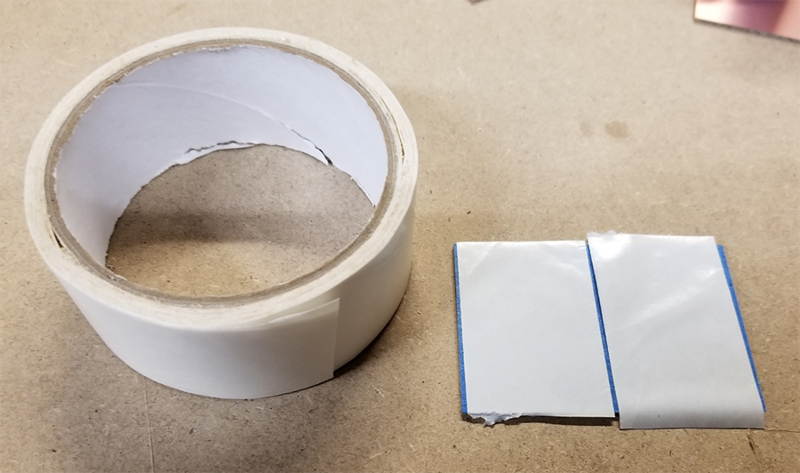 The materials were pretty easily available. 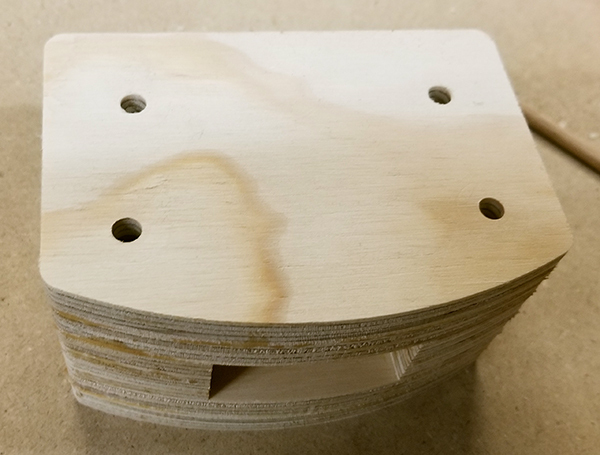 The end caps were cut out of ½” baltic birch plywood, with 270 discs coming out of a 5’x5’ sheet, enough for 135 strings of lights. The full sheets were cut into 20″x30” blanks on the table saw to fit on the MAX… one of the most awkward jobs because of the size and shape of the sheets! The acrylic tubes, 3” in diameter with ⅛” wall thickness, was purchased from Norva Plastics in Norfolk, VA. Each 6’ length yielded 15 tubes which were cut to length on a chopsaw with a stop block and a fine-toothed blade. I only needed two pieces of software, Google and VCarve. 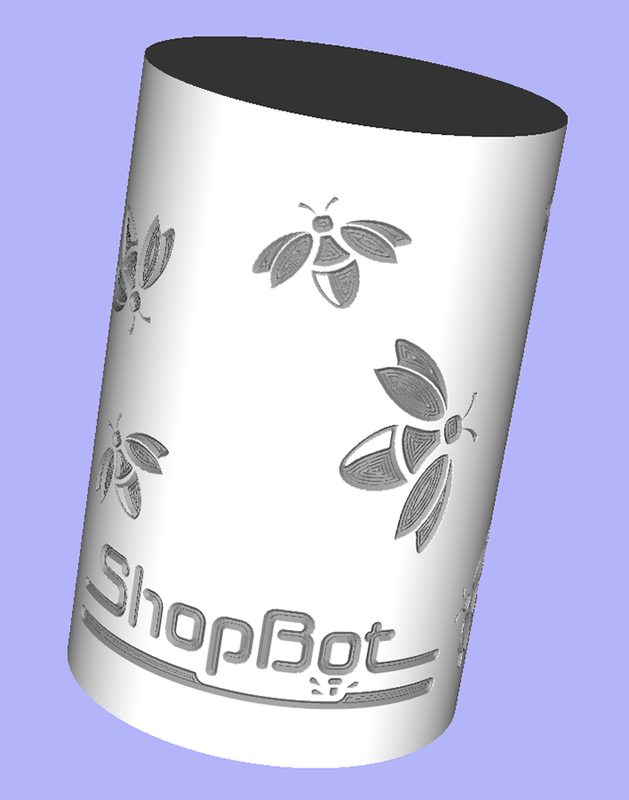 My idea was that I would carve fireflies around the tube, with the ShopBot logo along the bottom. 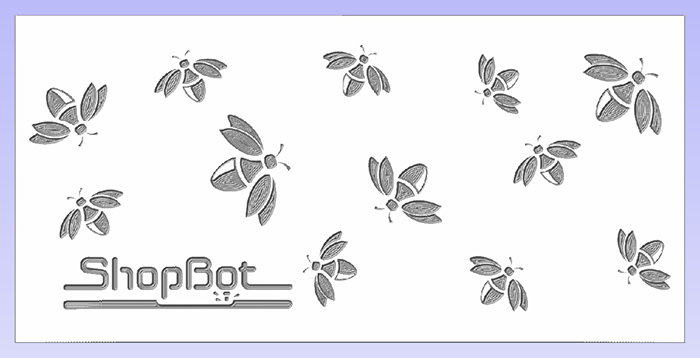 I had the ShopBot logo in a suitable format but needed fireflies, so I searched Google for firefly pictures and found one that I thought would work. Using the built-in tracing function in VCarve to digitize it, I made some changes to make it more carve-able and then modified it by rotating and changing the sizes to add some variety and to keep them from looking like they were rubber-stamped. 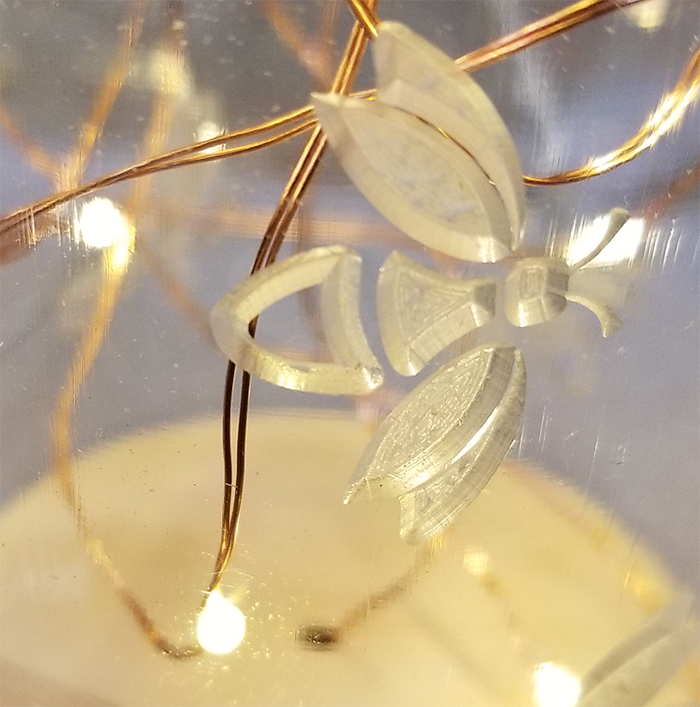 To place the fireflies and logo around the outside of the tubes I used a feature in VCarve software that lets you project a feature onto a surface and then “wrap” it around an object like my cylindrical tube. I toolpathed all the features with a 90-degree V-bit, limiting the depth of cut to 0.03” to make sure that I left plenty of the thin ⅛” wall uncut. After spending way too much time moving fireflies around and spinning them just a little bit. I came up with a layout that both Jeanne and I were happy with. It’s really hard to tell from a flat preview what it will look when it’s wrapped around the tube, but fortunately VCarve has the ability to preview the final file in-the-round. This helped confirm that it would look the way I wanted. 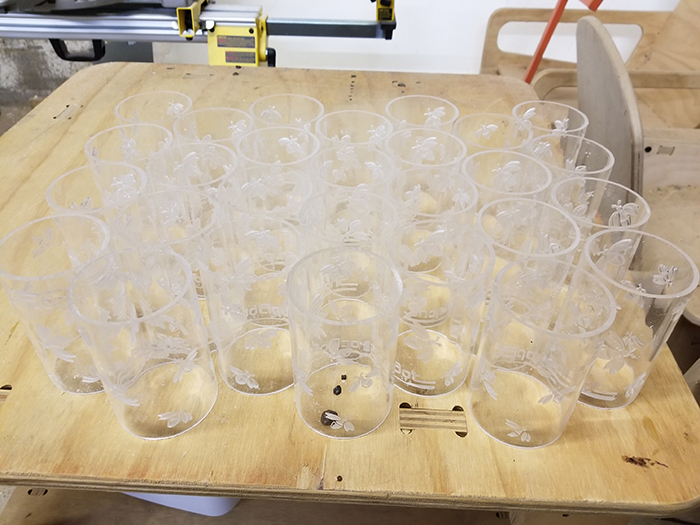 Engraving the tubes with the 90 degree V-bit would take about 12 minutes per tube, which would give me plenty of time to process the plywood parts and all the other jobs while they were cutting. 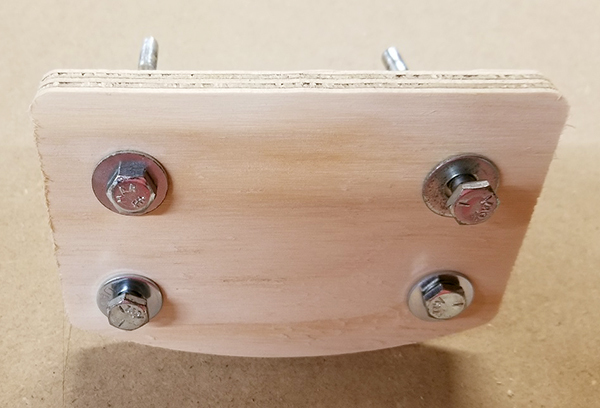 I made some quick modifications to the headstock of the indexer to create stops to precisely hold the tubes, but other than that it was off-the-shelf standard. 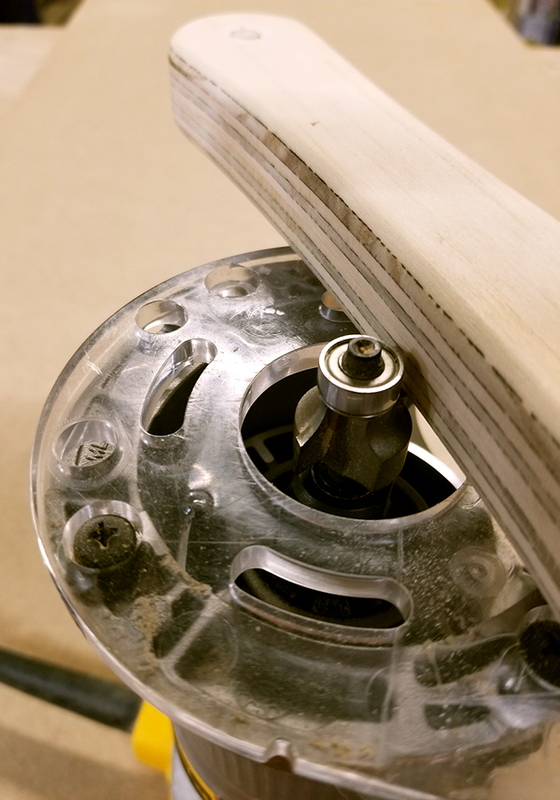 To hold the tailstock end I cut a tapered disk with the Handibot that fit into the end of the tube and kept it secure and centered. Every 12 minutes or so, a tube would have completed the engraving steps, ready to be removed from the indexer and replaced with a new one. They didn’t require any real post-processing, other than a quick sanding of the cut edges with a random orbit sander to remove any marks from the saw, and a shot of compressed air to blow off the dust. 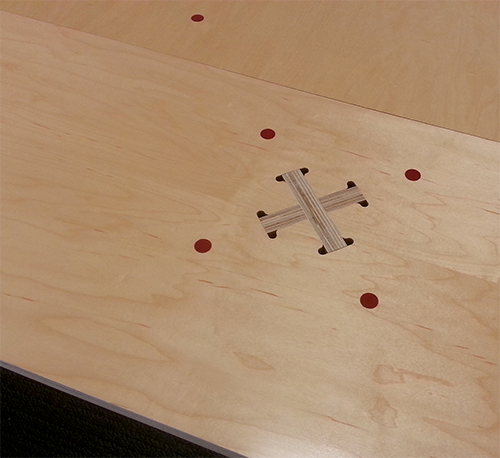 The plywood discs were cut on the Desktop MAX with a ¼” bit. They needed a shallow lip around their edge to keep them centered in the tubes and hold them in place, so each disc was cut in two stages. First the lip and then the cutout. A single small tab held them in the sheet during cutting, easily removed during the sanding steps. 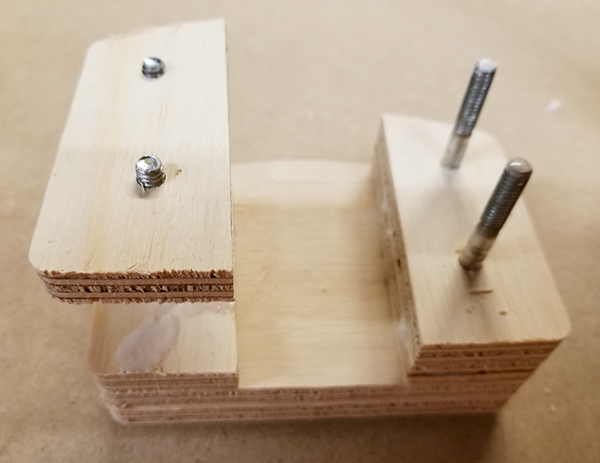 A holding jig was created for the Handibot to keep the discs registered and securely held in place using a small toggle clamp. Half of the discs became lids with a firefly carved into it with a V-bit. The other half of the discs became bases with a thru-hole for the wire and a groove so that it could exit from the side. These features were cut with a ⅛” straight bit. 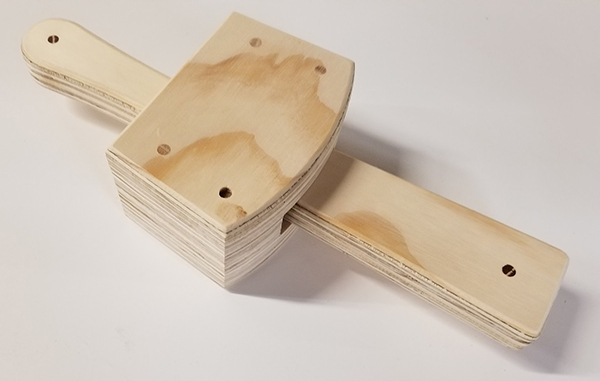 All the plywood parts were completed with a final sanding and finished with finishing oil mixed with a little bit of clear polyurethane for durability. They were wet-sanded with 400 grit sandpaper to help fill in the porous birch’s grain, and then left to dry. Inserting a base cap into each tube. Threading the LED wire through the hole in the base and pulling all 10’ through. Stuffing the LED wire back into the tube and adding the top cap. Hot gluing the power wire into the groove in the base and then covering it with a felt disc. Wrapping for shipping, then finally boxing and labeling. Then came the hardest part—pricing them. After making almost 200 of them I knew pretty much exactly what it took in time and materials to make one, so it was just a matter of calculating what they should sell for to make it worthwhile…a real product that makes money. The easiest method for me to figure it all out was to create a spreadsheet and enter every cost, broken into 3 categories: labor, materials, and machine time. Materials were easy, I had the cost figures for everything so all I had to do was add it all up. 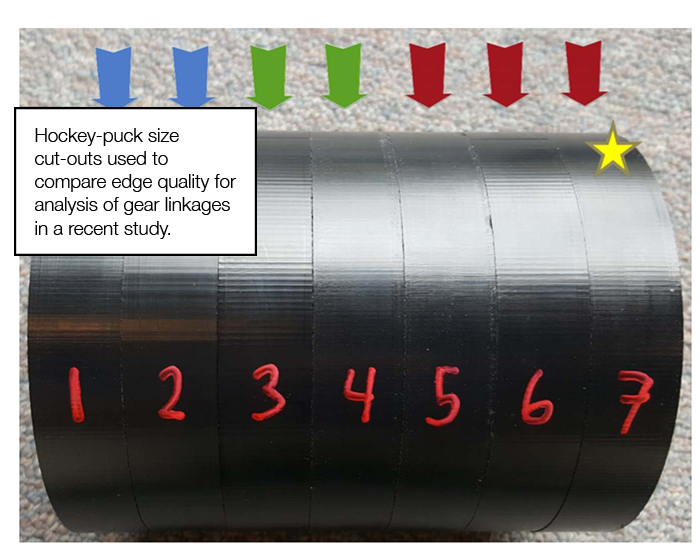 I added 100% to that figure to cover the cost of ordering, handling, and the general costs of the occasional, but inevitable, times when things go wrong and materials are unusable! Labor was priced at $20/hour, a decent hourly rate. After listing and recording the labor costs for each step, I totaled them all, added, and again multiplied by 100% to cover costs like overhead (taxes, insurance, etc.) and general operating costs. Machining time costs was a little more tricky. The time that someone had to spend to load and unload the tools was already included in the labor costs (including unproductive time waiting for parts to cut that only took a little time), so I calculated machine time costs to include electricity, bits, and enough to pay off the Handibot Smart Power Tools in a couple of months. I came up with $15/hour, but raised it to $25 just to give a bit of a cushion. 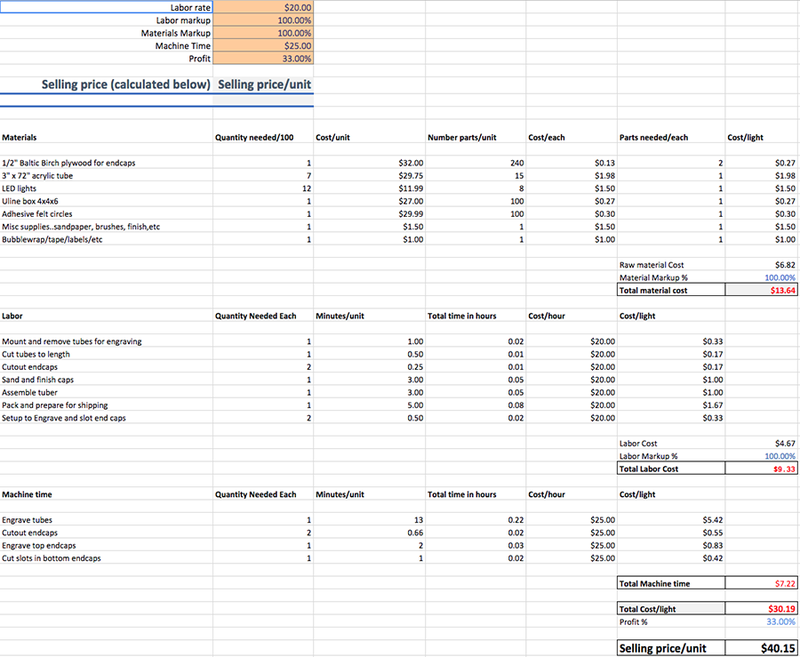 If you’d like to play around with the numbers and see how each component impacts the final cost, here is my pricing estimation spreadsheet for you to download. 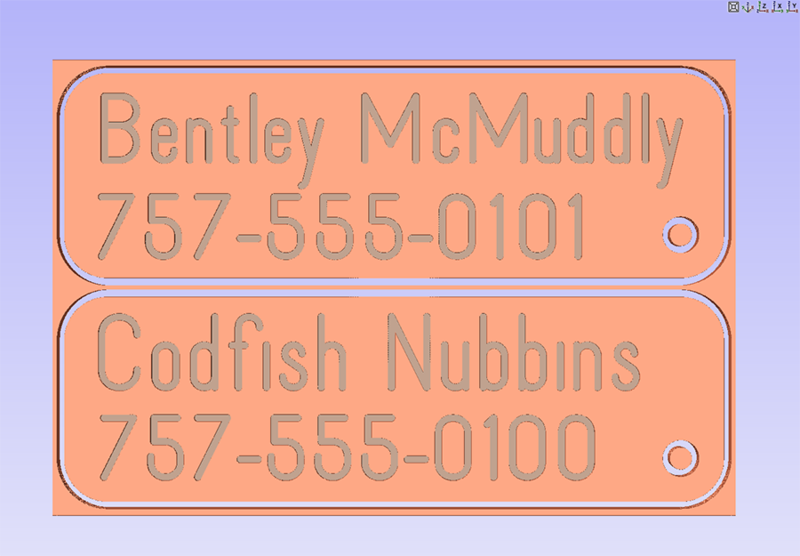 The actual hardest part was, and still is, deciding on a name for them. Since the beginning I’ve liked the name “Tubers” because they’re…well…tubes. I continue to call them tubers even though Jeanne insists that it’s a stupid name for anything not involving a potato. She’ll win of course, but I’ll go down fighting! 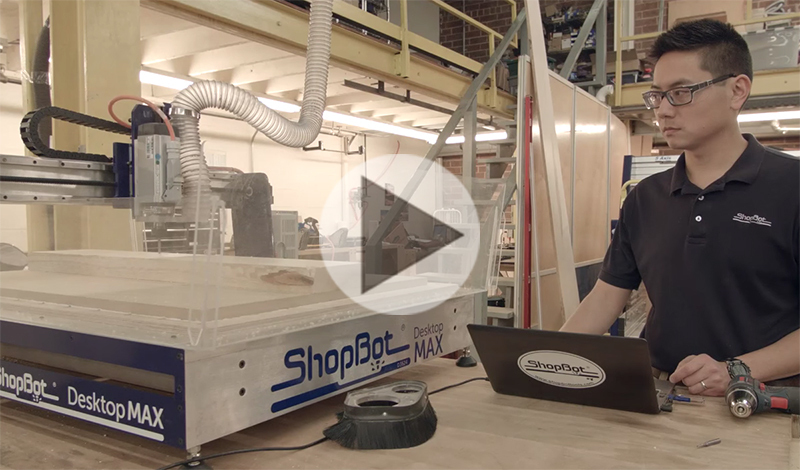 For more about the ShopBot Desktop MAX, visit the ShopBot website. For more about the Handibot® Smart Power Tool, visit the Handibot website. To learn more about VCarve Pro, visit the Vectric website. 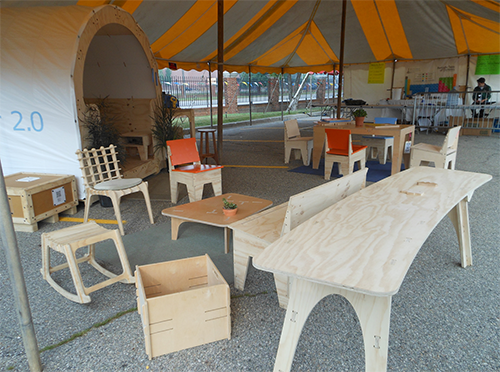 In the Fall of 2011 we were setting up the ShopBot booth at the NY Maker Faire and noticed some interesting plywood furniture across from us. It had obviously been fabricated on a CNC machine, with dogbones in the inside corners (which the designers called “snigglets”) and engravings on the tops to describe the process. Ted and I introduced ourselves to Anne Filson and Gary Rohrbacher, architects and University of Kentucky professors, who it turns out had been following our work via 100kGarages. Their design firm, AtFAB, had been designing furniture and making the files publicly available—using 100kGarages fabricators to get much of it made. I’ve kept in touch with Anne and Gary over the years and have fabricated a handful of projects with them. 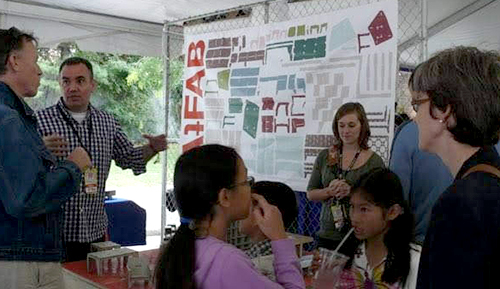 We did the “Open Source Living Room” together at the 2014 Detroit Maker Faire that showcased Open designs of all kinds, from AtFAB stools and tables to the first 8×8 Shelter 2.0 design. I also fabricated pieces for an exhibition they had at a gallery on the MIT campus in 2013, but the biggest project by far involved fabricating the furniture for MakerBot’s penthouse office in Brooklyn in 2013: the reception desk, meeting and conference tables, assorted chairs and desks, and even Bre Pettis’ office desk. All these projects were fun to do so I was excited when I got a call from Anne a couple of weeks ago about a new project they were working on. 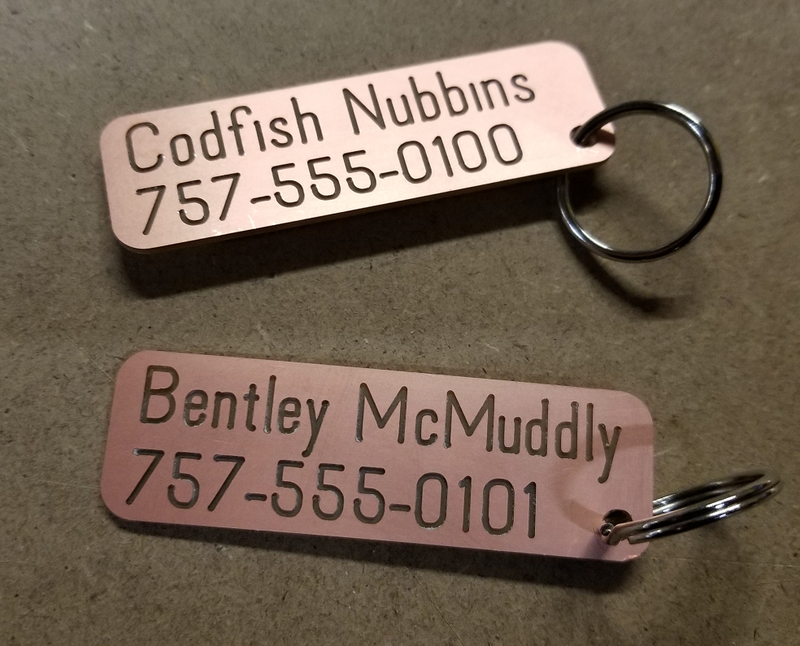 They were both on sabbatical this semester and were working on some CNC fabrication instructions, and wondered if they could come to my shop in VA, talk a bit, and do some test cutting. I quickly agreed and made sure I had a couple of sheets of 3/4″ Radiata pine plywood and enough propane in the grill to cook hot dogs for lunch! We started out by toolpathing a sheet in VCarvePro, our toolpathing preference, and cutting them out with bits that they had brought, an 1/8″ straight bit to mark the location of screw holes and a 1/4″ upspiral to cut out he parts. 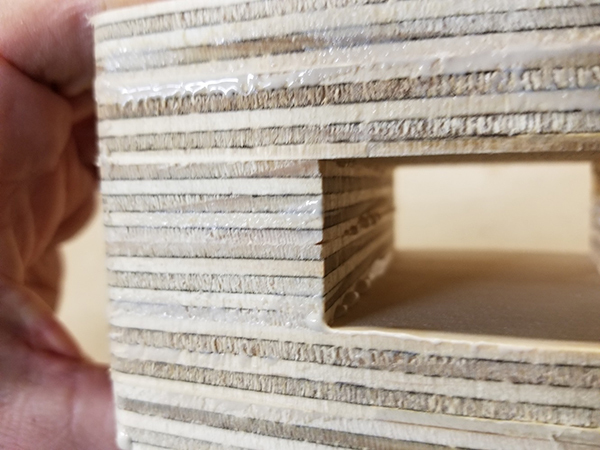 Although I generally cut 3/4″ plywood in 2 passes at 4″/sec, I wanted to be somewhat conservative for this and use the rule-of-thumb and cut each pass at the bit diameter, 1/4″. I’ve written about my toolpathing and cutting techniques in a Medium post “A slacker’s take on CNC fabrication” and used basically the same system for these parts. There were a handful of small parts that I cut first using a spiral plunge, with a single tab at the start point. The rest of the parts I organized in increasing size, using a straight 4″ plunge and no tabs. The sheet finished machining in about 40 minutes, with Anne spending a little time cleaning things up on my assortment of sanders and Gary assembling the pieces. At the end of the day, my wife and I joined them for a great seafood dinner at The Shanty in Cape Charles VA, and the next day we were off to Baltimore to visit OpenWorks in Baltimore. While we were at OpenWorks, they had the opportunity to cut the same parts they had cut in my shop, out of ApplePly on the $60k Laguna CNC machine in the OpenWorks production shop. As you would expect, the parts from the Laguna turned out really nice and needed no sanding, but took a full sheet of parts to dial in the settings and required two passes each with downspiral and upspiral bits to get that quality. 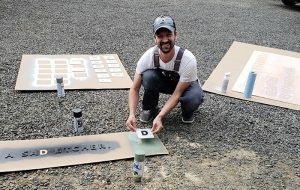 Sea Reach Ltd. in Sheridan, OR, is a design company that also makes signs. Their strong commitment to the environment and education, both nationally and internationally, is something that is very apparent by the content they post to their blog. In addition to working on private projects, Sea Reach’s clients include the U.S. Forest Service and other government agencies, as well as educational institutions. 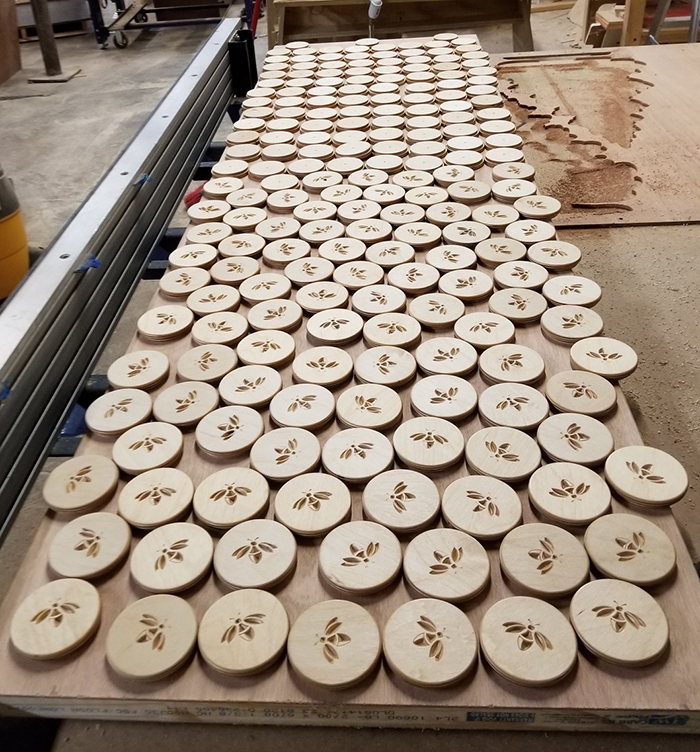 Sea Reach designs and prints graphics on-site, and has a production facility for manufacturing a wide variety of things—from the posts signage hangs on, to outfitting a van that will be a mobile visitor’s center for Shenandoah National Park in Virginia. 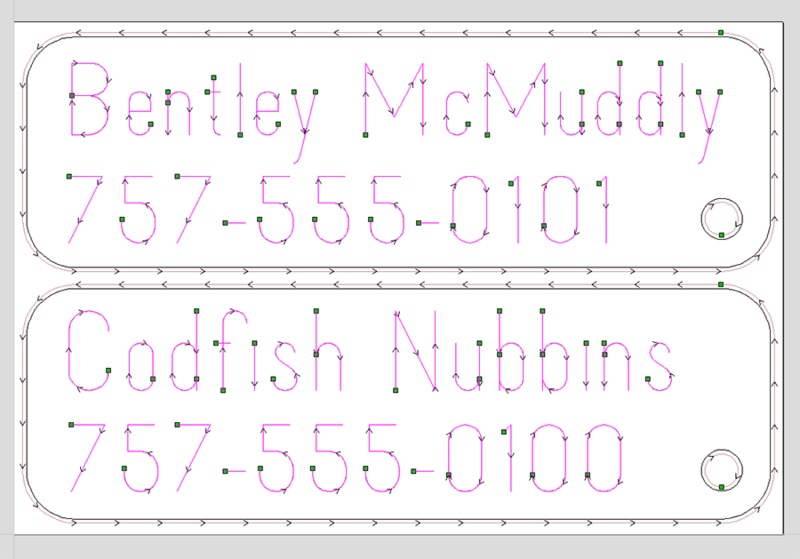 Where appropriate, they used to outsource some aspects of a project, like v-carving a sign, or cutting out graphics printed on high pressure laminate. In order to bring some of that back in-house, they purchased a pre-owned ShopBot from a company in Portland. The ShopBot came with an operator who had used the machine for working with wood, but the operator had moved on. Recently, Sea Reach received a grant related to Workforce Development in Oregon. 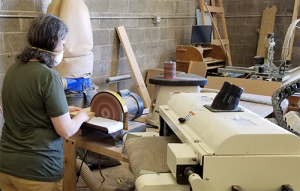 The grant provided the opportunity to hire someone from ShopBot to travel to Oregon to tune-up and upgrade their ShopBot, as well as give 5 days of training and support to teach a number of their employees the true capabilities of the machine. Before going out to their facility, I consulted with Kelly Crees, Operations Manager of Sea Reach, via email and phone calls to determine what they wanted to do with their ShopBot and what supplies they might need. Kelly sent photos of the ShopBot to help identify the components of the tool, including the control box and card, motors, pinion gears, Z-axis, and spindle. The tool was a PRTalpha with a Colombo spindle, circa 2004. A new computer for design work, new Aspire CAD/CAM software, and consumables such as pinion gears, bits, and collets also became part of the package. 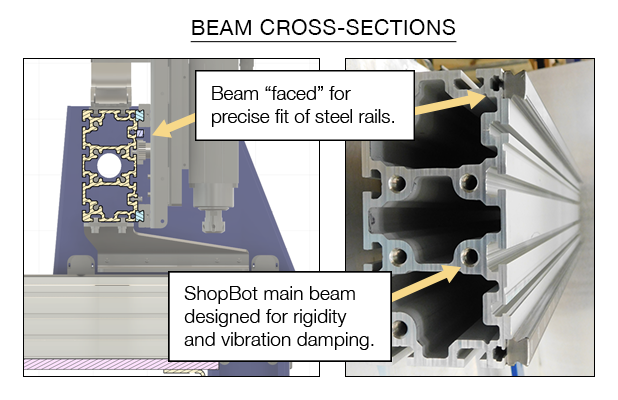 The initial visit indicated that the ShopBot had been well-maintained by the previous operator, and a creative vacuum hold down system had been put in place. 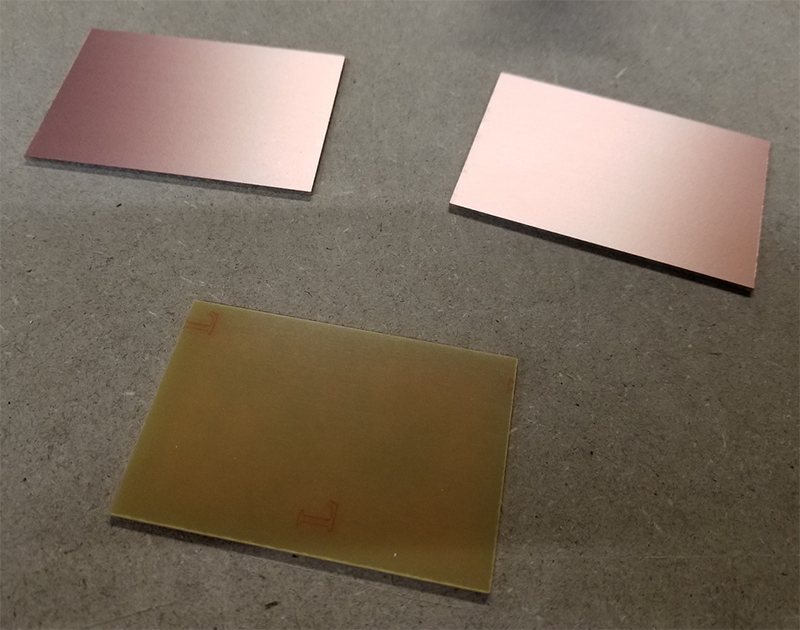 The charred state of the bits and collets used for cutting out the high-pressure laminate (a paper infused with plastic) told me that the company could use some help with feeds and speeds for cutting different materials. 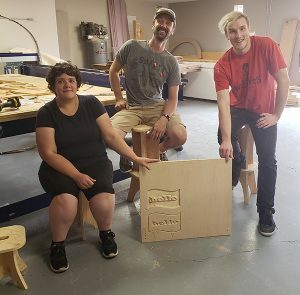 Since the tool was useable as it was, we jumped into training Melissa (graphic design), Chris (woodworking) and Danny (summer assistant) on how to set up the ShopBot and use Aspire to create files. ShopBot founder Ted Hall was on vacation in Portland on the third day and was recruited to help with changing out pinion gears, reprogramming drivers, and tweaking settings to make the tool hum as it did its work. Should they choose to put the tool into full-time production in the future, there are a few upgrades Sea Reach can make, such as replacing the 14- year-old spindle and upgrading the control card to bring the control box up to the current ShopBot tool standards. The grant also includes more time for consulting on specific projects, such as v-carving and using Aspire to create 3D models for casting bronze. 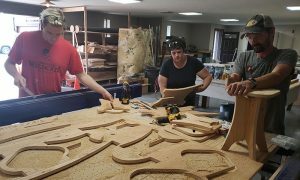 Sea Reach’s use of their ShopBot for new and exciting projects is just beginning. Another sign project emphasized pocketing, inlays and painting techniques. Melissa and Chris work on ensuring that the design printed on the High Pressure Laminate matches the graphics created on the computer. Registration guides are printed with the graphics to help align the CNC machine, and to test if the materials stretched in either or both axes during the printing process. By using the correct bit and adjusting the RPM’s of the spindle, the HPL cut out smoothly and easily. ShopBot is pleased to offer (for a fee) help with upgrading an older ShopBot and training new operators on how to use it effectively and efficiently. A document on the ShopBot website can help customers identify what tool they have when they’re ready to discuss a tool upgrade with the staff at ShopBot. 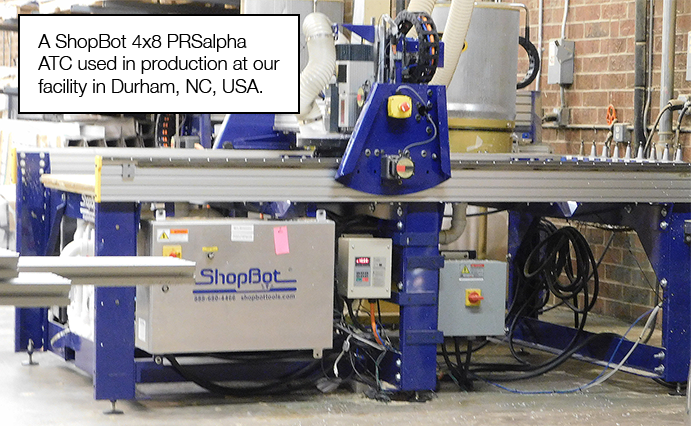 Contact ShopBot via phone at 888-680-4466, or visit the website, for information on training options, including free videos and documentation, classes at the ShopBot facility in Durham, NC, and customized professional development on-site. The CNC below is frequently compared to our ShopBot Desktop and ShopBot Desktop MAX tools. This tool is imported from China by several different resellers in North America. It is also available directly from China from the internet. Prices for the tool vary from $2,800 to $6,500, depending on the reseller. From published specs, the tools are apparently identical though they do have different decals. We thought it helpful to directly compare a few of the characteristics, capabilities, and features of this tool to the ShopBot Desktop and Desktop MAX CNCs. ShopBot Desktops and Desktop MAXs have a heavy, solid aluminum frame and a ‘dual-drive’ gantry. Dual-drive means there is a motor and drive system at each side of the gantry. Dual-drive insures that the gantry moves evenly and that it will not be deflected or racked when machining on the left or right side of the centerline. In contrast, the imported CNC has a single, center-drive screw and motor for the gantry that is positioned in the middle of the bay under the deck. This screw is attached to a tie bar that is then attached to the two ends of the gantry. With this system, as cutting moves further and further off the centerline, the gantry can be deflected or racked from the asymmetrical forces to each side of the centerline. One less motor and one less drive system helps reduce costs in the imported tools, but racking will be a source of inaccuracy that needs to be managed. The limitations will come into play with any heavy work, such as cutting or carving hardwoods or machining aluminum. 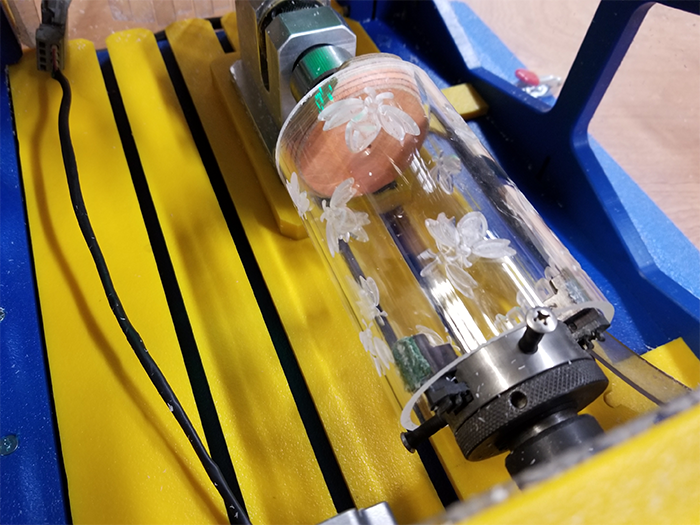 It will also show up in edge quality when cutting plastics and it will make it more difficult doing precision work such as inlays, routing printed circuit boards, or carving jewelry difficult. 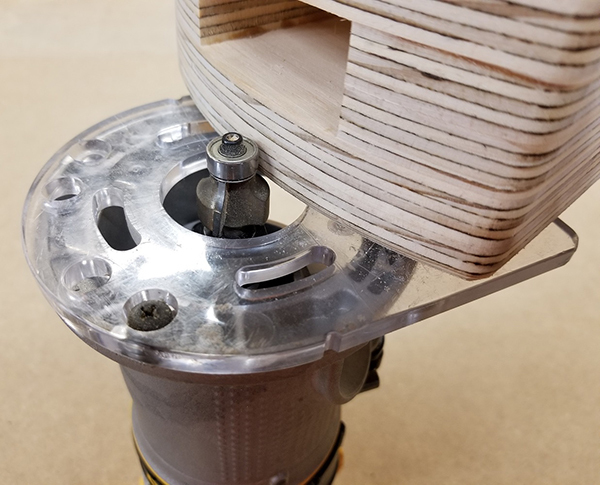 A second advantage of the ShopBot’s dual-drive design is that it leaves the area under the bed of the router available for other functionality. In comparison, on a center-drive tool, the tie-bar mechanism moving back and forth under the deck makes that area unavailable for other use. For example, with the open, dual-drive of the ShopBot Desktop and Desktop MAX design, the area under the deck is available to create a full vacuum hold-down system (which you can make yourself or purchase from us). 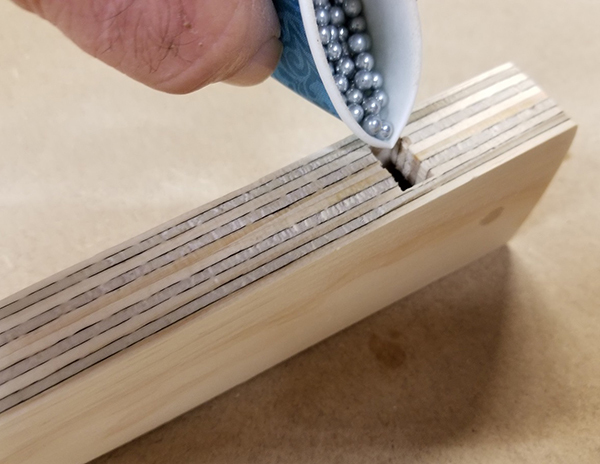 Moreover, the deck can be removed to allow machining of larger blocks of material, or to add fixturing such as that for our joint-making edge clamp (see detail below), or even to create space for something like an extra-large indexing/turning system. We do favor using a screw-drive mechanism of some type for motion production in Desktop CNC’s. Screws provide excellent precision and virtually eliminate backlash. However, there are several options for such screws. After having experience with ball-screw systems (these employ ball-bearings inside the nut that rides on the screw) on earlier CNC tools, we chose a Teflon-coated lead screw for our Desktops, manufactured integral to the motor, along with a composite anti-backlash nut (that does not employ internal ball-bearings). The integral-screw keeps the mechanism simple and the axes aligned. In a typical ball-screw installation, couplers, universal joints, and outboard bearings must all be kept in alignment with the ball-nut – a complexity that increases the likelihood that maintenance attention to alignment will be needed. A bigger issue with the ball-screw on these tools is that lubrication with oil is required. It’s a maintenance thing, but more importantly, because the upper-gantry screw is close to the cutting area and unprotected on these small tools, the oil will attract dust and debris and clog the ball-bearings and their channels. Sure, a lot of big CNC’s use ball screws. But, there is typically protection of those screws in the form of shrouds or bellows. For our Desktops, dust simply falls off our Teflon screws as they spin. A final mechanical issue is the spindle. We’ve noted that the water-cooled spindle on the imported tools probably won’t be a deal-breaker because it can be replaced. 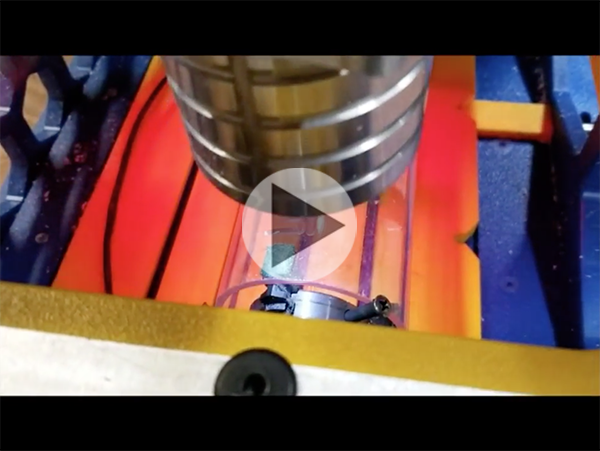 The rationale for the water-cooled spindle is that it is inexpensive – and that it will get you started. But water-cooling is awkward and involves the distracting maintenance of keeping a bucket of water from getting moldy and a pump clean and functioning. It makes these spindles a production liability, particularly in comparison to the air-cooled, European-style spindles that have been the industry standard for 50 years. In contrast to the imported tools, the ShopBot Desktop and Desktop MAX CNCs come standard with HSD, air-cooled, industrial spindles. In comparison with the very basic control system of the imported tool, ShopBots come standard with a full ShopBot controller and ShopBot Control Software. 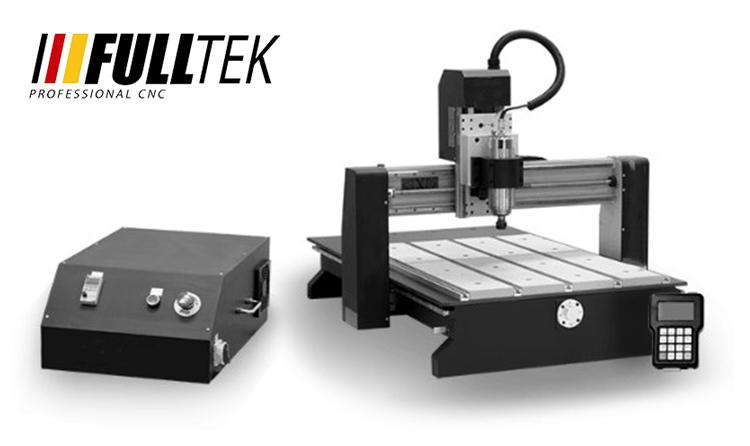 This controller is the same as on our larger tools and includes all ShopBot functionality, including expandability to additional axes and control of additional accessory functions. A full CNC control creates opportunities to add features like a rotary indexer accessory that converts your Desktop into a turning daemon, doing carvings, ornamental turnings, and 3D objects in the round. The controller also supports other standard CNC attachments such as active, tangential, knives for cutting fiber materials. We think of our Desktop CNCs as platforms for digital productivity – with options for numerous types of manufacturing assistance and supported by a set of full and expandable controls. The electronic control and software system that run our tools are tightly integrated with our tools because they were designed for the tools. We believe that good tools start with good mechanicals, but over the years of producing and using CNC tools we have come to believe that software control systems are equally important. Our software focus is on a control system that provides both smooth, efficient cutting and ease-of-use in production. Our recognition of the importance of software distinguishes us as the only manufacturer of affordable CNC tools that produces its own controls and software. Our software provides smooth cutting motion and crisp acceleration. We have focused on getting high-resolution, straight-line and complex curved motion that is chatter-free with crisp accelerations and decelerations to make cutting efficient. 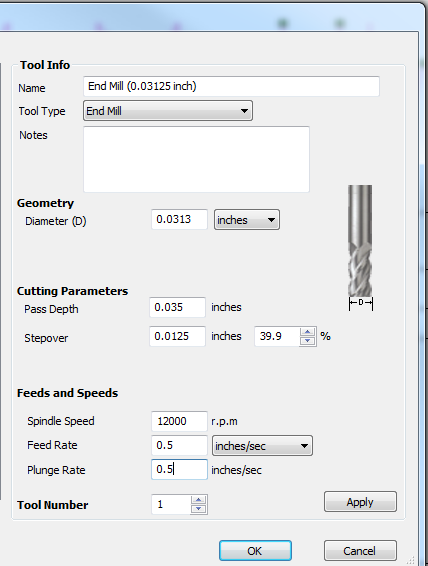 ShopBot’s feed-rates, speeds, and accelerations are fully adjustable in the tool’s software interface and from within toolpath files. 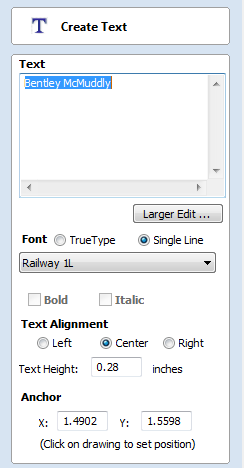 ShopBot’s software interface is straightforward and intuitive to use. Carrying out basic tasks and housekeeping functions such as homing is intuitive. The control software runs toolpath files (part files) generated from virtually any CAD/CAM program. It can utilize files in standard g-code format (Fanuc/NIST RS274) and well as toolpath files that have been created in OpenSBP, an open-syntax CNC language (supported by most current CAD/CAM software). You are thus able to run ShopBots with two different types of CNC files. Traditional g-code is fine for just running files output by CAD/CAM programs. It may feel particularly friendly if you are a CNC operator experienced with other tools. ShopBot’s OpenSBP option, provides a second and more ‘conversational’ language that is easy for a human to read, understand, and use. Unlike g-code, OpenSBP includes built-in programming functions (such as variables, logic testing, and looping) that make it readily programmed using friendly, BASIC-language-like expressions. OpenSBP makes it straightforward to do everything from creating a button for regularly moving a tool to a standard position, to creating production routines that will improve the efficiency of workers as they manage jobs and files and move parts through your production process. We continuously evolve our control systems and software as opportunities to add capabilities and features become available. The most recent control software for your tool is always available for download from our website, FREE. When the availability of new electronics allows us to develop improved controllers, we also make them available for older ShopBots. It is possible to retrofit our latest control cards or control box – greatly improving the functionality of a tool – to virtually any age ShopBot. Our software provides an incredible base of learning resource for CNC. That’s because all ShopBots work the same. Information across our wide spectrum of users makes it easy to get any question answered. Check out our huge web library of free training videos and webinars. Or, look through years of information, help, and hints about fabbing with CNC in our Talk ShopBot Forum. All our tools come with two, CAD/CAM design software packages. VCarve Pro is acknowledged as one of the easiest-to-use design tools for getting into CNC. For advanced, engineering-driven work, we provide a year’s license to Autodesk’s Fusion 360, a full design, modeling, and rendering program with integrated CAM. 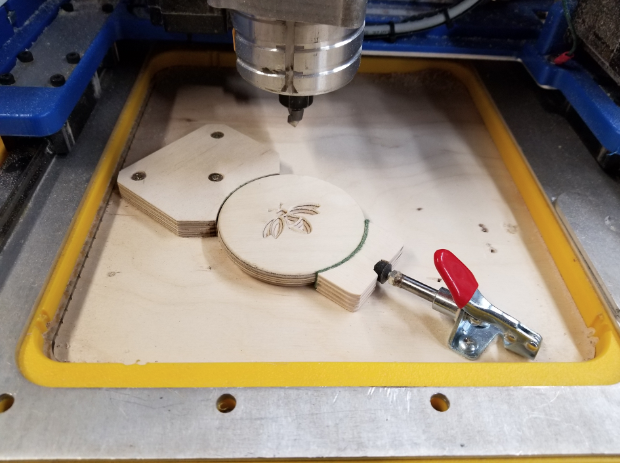 Making a Benchtop CNC an Agile Production Monster! The concept of a desktop or benchtop tool is that it is agile and portable. That for a given project, it can be put on one bench or another or put on a rolling bench and moved around the shop or factory floor. Portability is not possible if a new 220V circuit must be installed every time you want to move the tool, or if a long, heavy 220V cable needs to be dragged across the floor of your shop. Our Desktop CNCs are designed to provide the highest level of speed, power, precision, and cutting force in a tool that is connected to a standard 110VAC outlet. When you are ready to move a ShopBot Desktop or Desktop MAX CNC to another location. Do it – and, then just plug it into a different outlet. We designed and built these tools from the ground up with agility and configurability in mind. ShopBot Desktops have the power and rigidity of full-size CNC’s and they have as much spindle power as can be packed into 110V. (*If you may have been considering a CNC tool with a woodworking router, please have a look at this white paper comparing the measurement of router cutting power to spindle cutting power). We’re very enthusiastic about benchtop CNC tools as production assets for small manufacturing. These tools are frequently as productive as full-size tools when material size is small. They are capable of high precision and powerful cutting because, relatively speaking, they can be quite rigid. Many can double as small mills for working with aluminum and can optionally power a 4th, rotary axis for turning and 3D shaping. 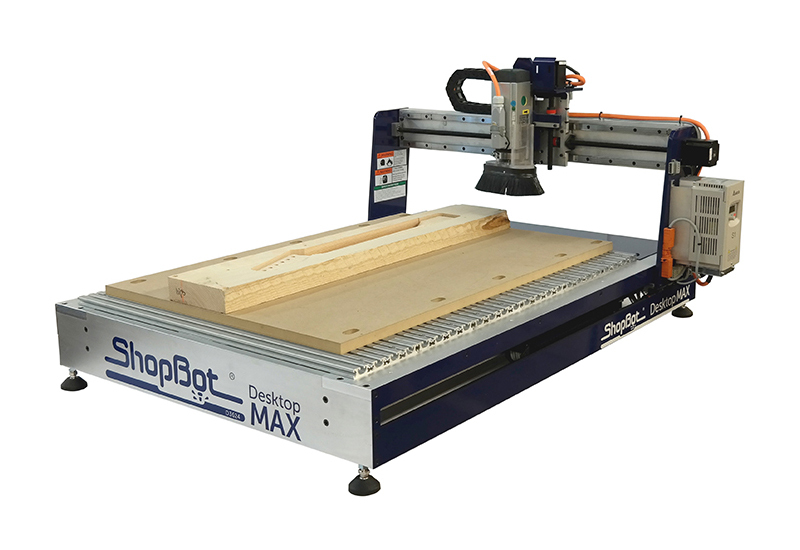 It is often believed that the cost difference between imported products and products like the ShopBot Desktop and Desktop MAX is a result of inexpensive offshore labor. It does cost a little more to build equipment in the US than offshore. But as far as our Desktop CNC tools go, the cost differences in comparison to these imported tools reflects what you are getting. Our tools offer a stronger design that provides greater capabilities and more extensive features. You are buying more tool. You are buying the capability, configurability, agility, and support system to best accomplish your work and to make you productive. We’ve been following Brooke M Davis’ work since 2012 after she purchased her full size ShopBot. 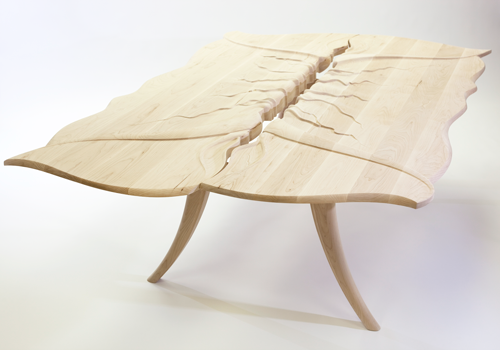 Brooke has continued to design and fabricate beautiful, organic, functional furniture that can easily be categorized as art. In fact, Brooke’s work can be found at the CraftTexas 2018 show at the Houston Center for Contemporary Craft, September 29, 2018 — January 6, 2019. 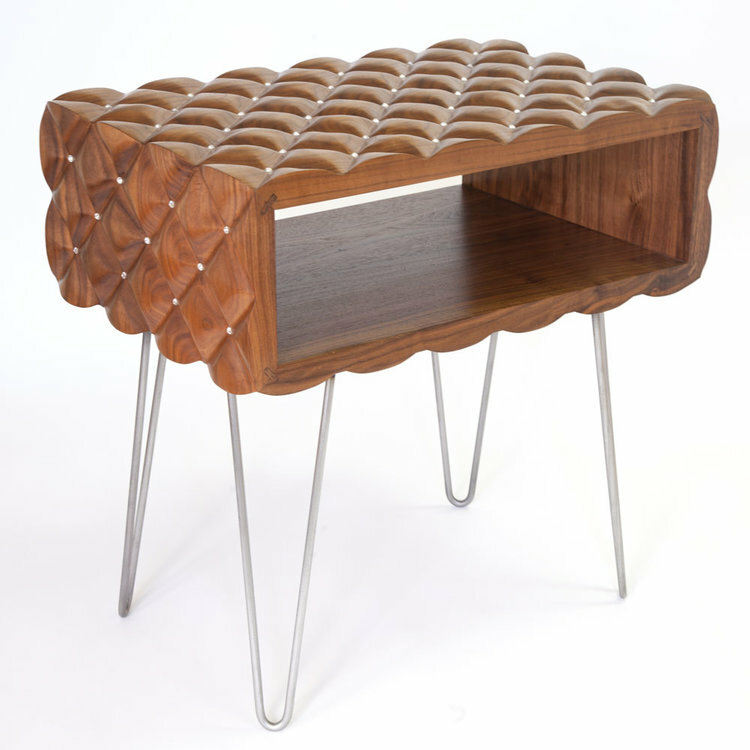 Brooke’s newest work includes the plush tufted walnut side table (above) that is both elegant and inviting. 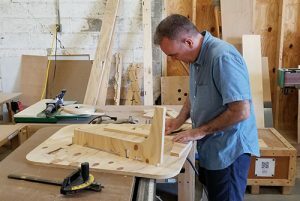 Not only will it be displayed in the Texas Furniture Makers Fair at Kerr Arts Cultural Center in November, she will be showing it in Milan at the Salone Del Mobile in April 2019. Keep an eye on her website: brookemdavisdesign.com for more exciting work to come. 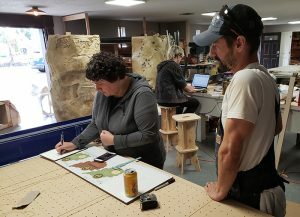 MakeShift, her design consulting service and production facility, continues to thrive and regularly sees a wide variety of work through the shop that keeps things interesting. Brooke and her team handle prototyping work, product development classes, design consultation, and more to the Austin, TX area—and beyond. This is a unique space where real product ideas come to life. We are looking forward to seeing what’s next for Brooke. Take a look back at the story about Brooke from 2012 below. Brooke M Davis Design blurs the line between artisan and designer by combining artistic expression with design precision to produce luxury craftsmanship. The process involves coupling mass production techniques like computer aided design with hands on master craftsmanship to create new and exciting results. With individuality in mind, this process allows for ease of customization at the client’s request. Brooke’s collections range from high-end one-of-a-kind pieces to limited run productions. With quality craftsmanship and attention to detail, every piece is made to order with quality in mind. She works with individual clients, interior designers, and architects to offer a variety of services to meet innovative project needs. Specialties include limited run CNC production, industrial design, furniture design, and custom architectural installations. 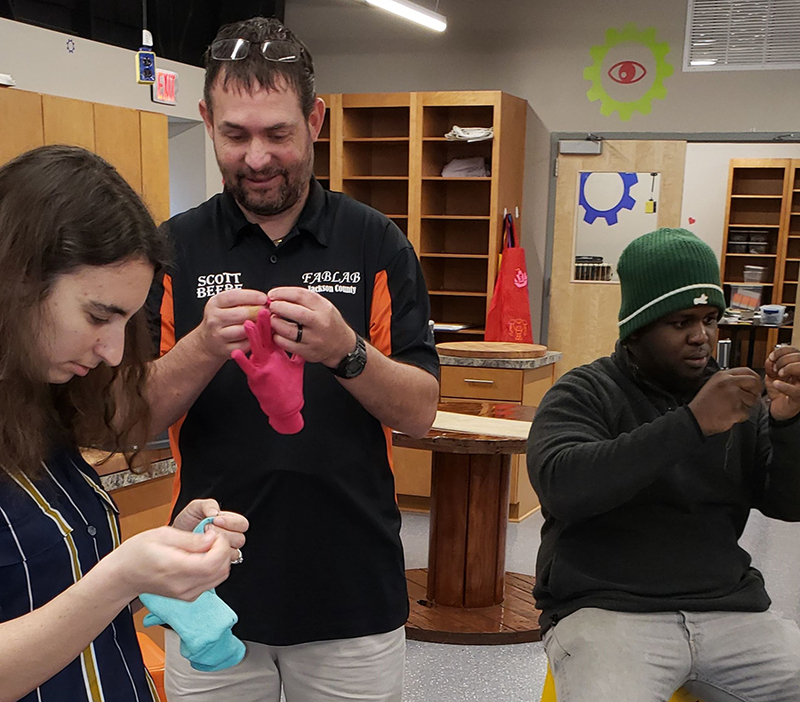 “I’d worked with ShopBots throughout my education and teaching positions, so I was very familiar with their tools and capabilities. CNC technology became ingrained into my creative processes from the start, and I always integrate it into my design and production process. I finally bought my own ShopBot in May of 2011 and it’s been everything I knew it would be.